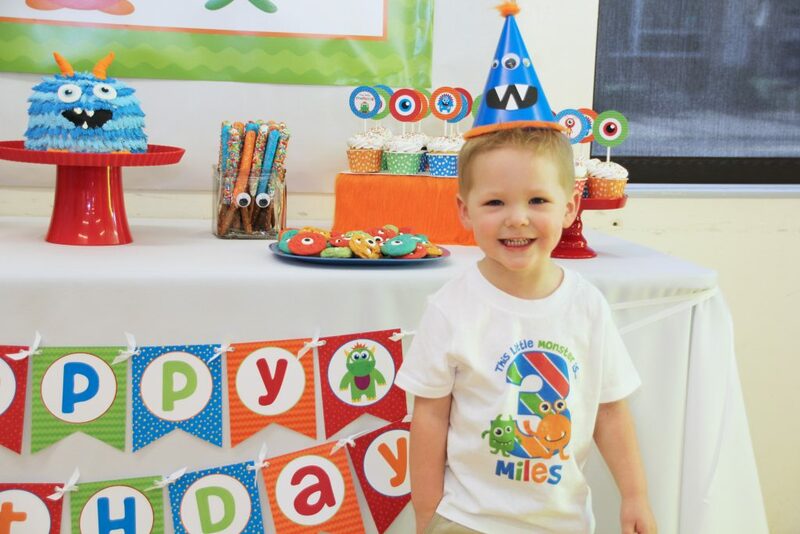 Our little monster turned 3! 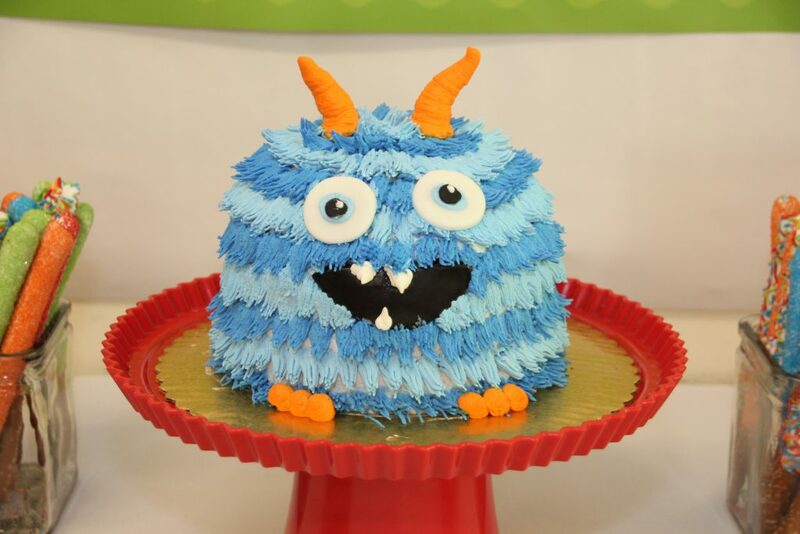 Monster has always been a nickname for our youngest, so it seemed like a perfect theme. I knew I wanted a variety of friendly monsters and bright colors. I LOVE how this party turned out. 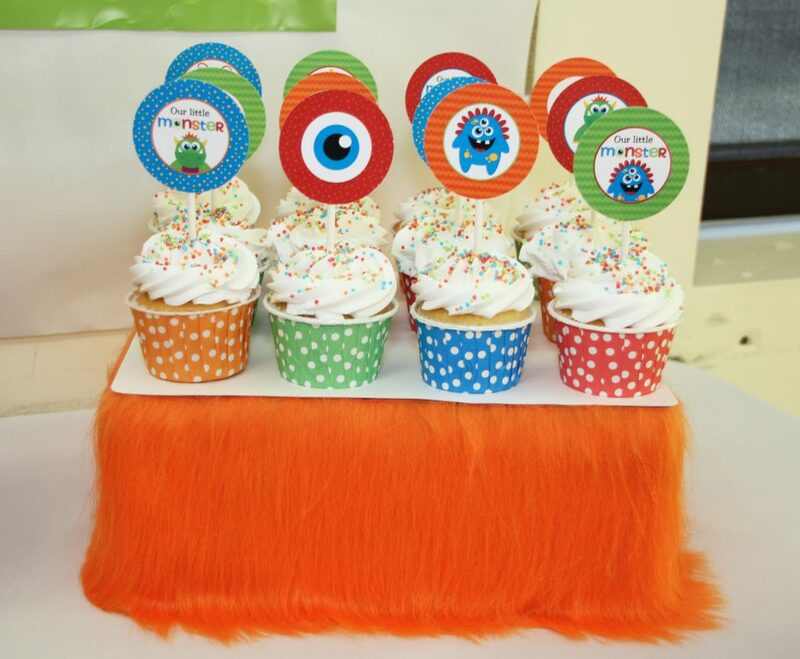 Classic white cupcakes are dressed up with printable monster cupcake toppers. I love the big eyeball. haha! I created these fun cupcake stands by covering a box in fur fabric. It added a fun monster feel and a great pop of color. 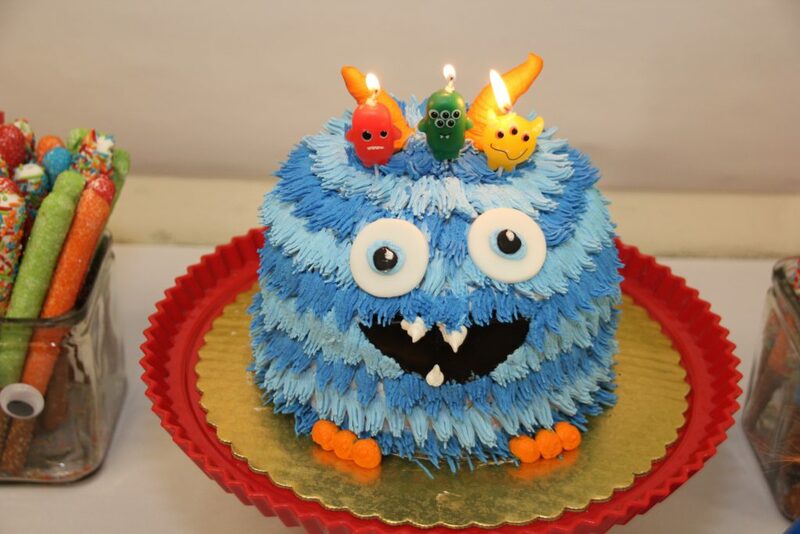 This cute little monster cake was one of my favorite items of the party. Blue for my son’s favorite color. There are lots of tutorials on pinterest to make these yourself. One of the things I loved about this theme was all of the cute treats that could be made. 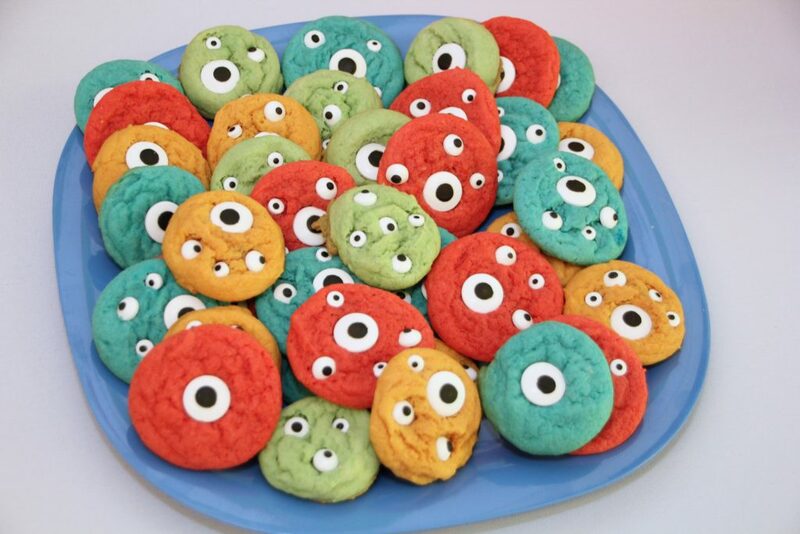 Wilton sugar eyeballs in several sizes were added to colored sugar cookies for a silly monster cookie. Dipped pretzels are a favorite at my parties. I purchase pretzel rods at my grocery store and dip them in melted Wilton’s white candy melts. Then top with sprinkles of your choice. I added them to clear jar with eyeballs to make bright monster hair. My son requested a party hat last minute. 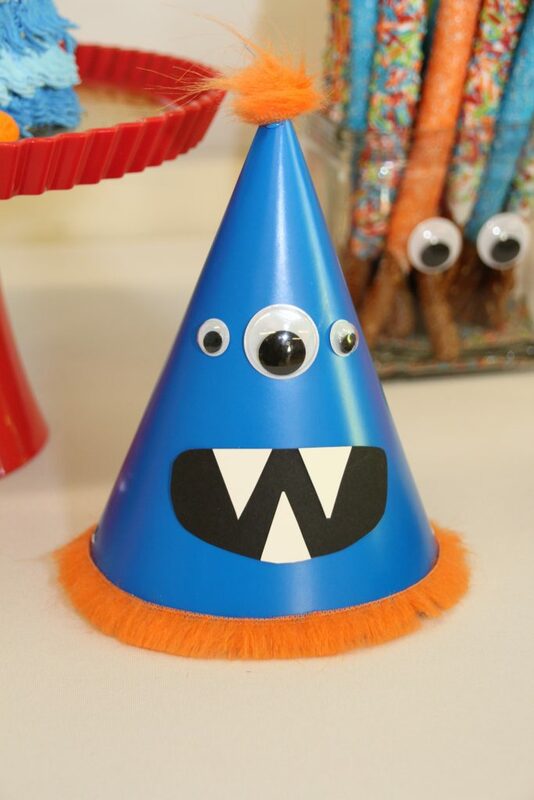 I found a plain blue party hat at my local party store and dressed it up with googly eyeballs, a card stock mouth, and fur accents left over from my boxes. Isn’t that hat the cutest? Ok maybe the birthday boy adds to the cute factor. 🙂 I found his adorable shirt on etsy from Heather Rogers Designs. It was perfect! 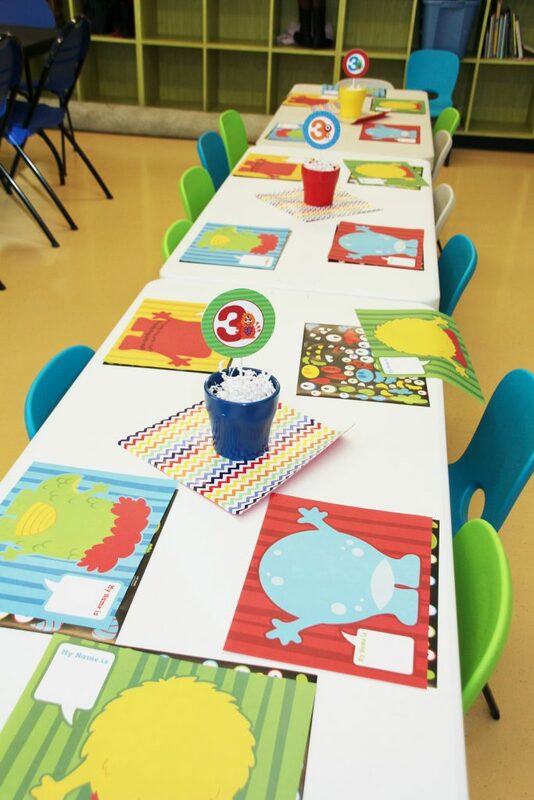 I created a kids party table with simple centerpieces made from my printable party circles in colored containers and monster sticker sheets. 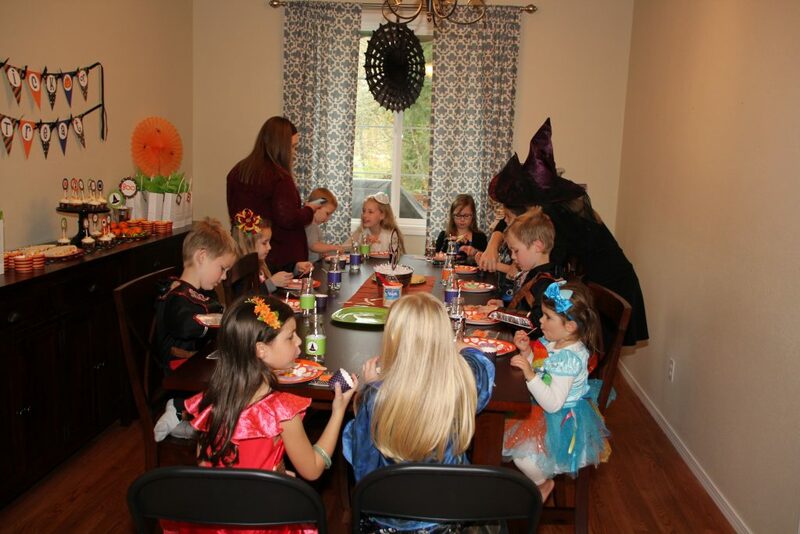 We had an Adopt a Monster table for guests to take home a party favor as they left. 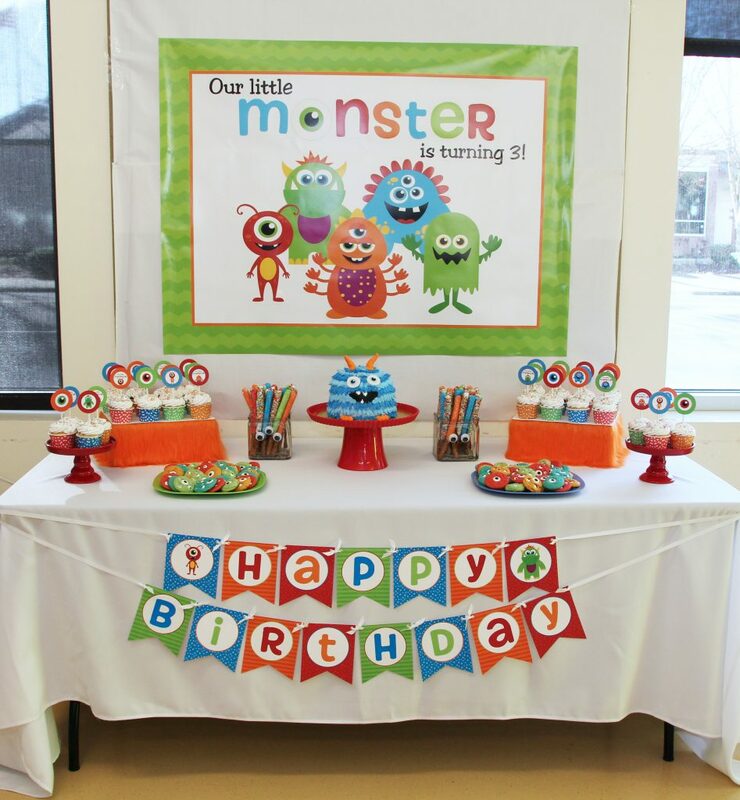 My printable monster centerpiece circles created a cute display. 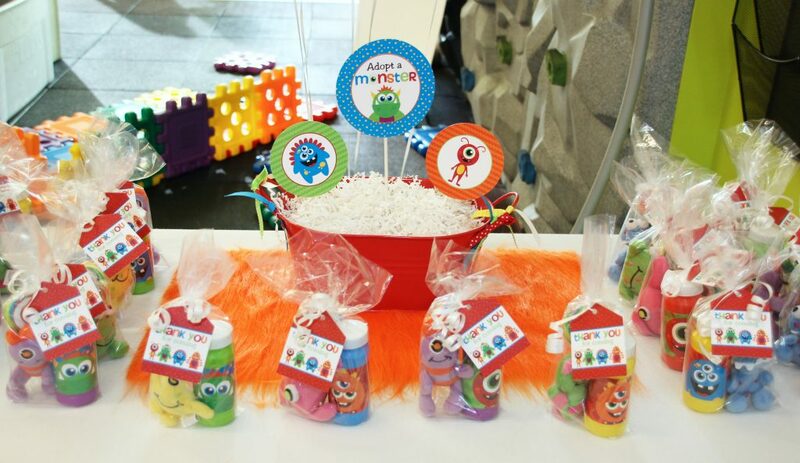 Each favor had a mini plush monster, bubbles with a printable label, and a monster sucker. 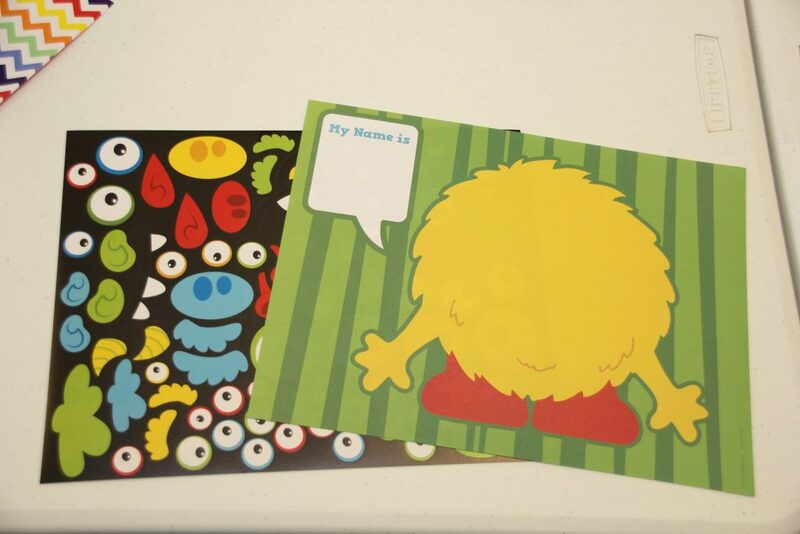 They were packaged with my printable monster favor tags. A friend and I created this monster bean bag toss. 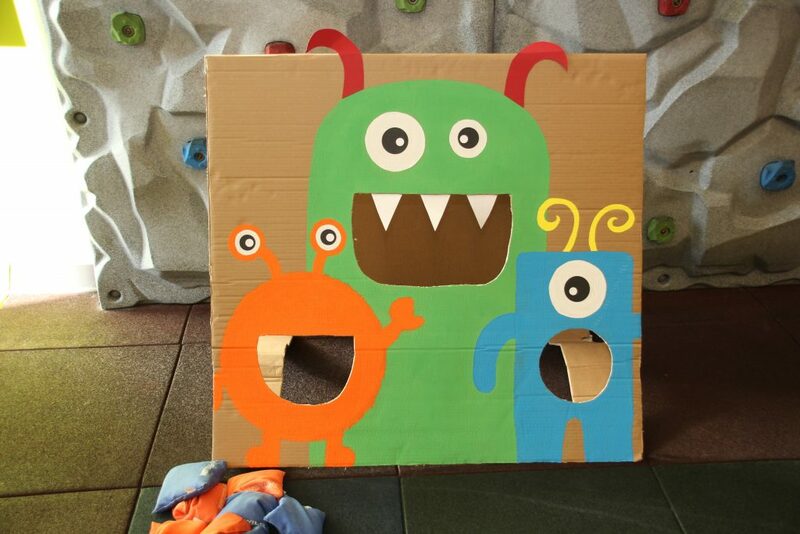 We used a large card board box and craft paint. 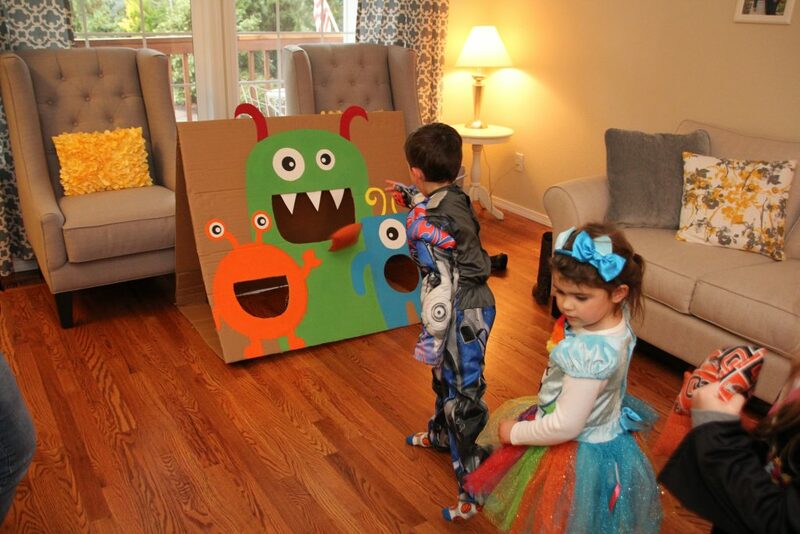 Pizza pans and cookie sheets made perfect stencils for our smaller monsters. We used an exacto knife to cut out their mouths. We cut out the horns, teeth, and eyes from card stock to add some extra details. 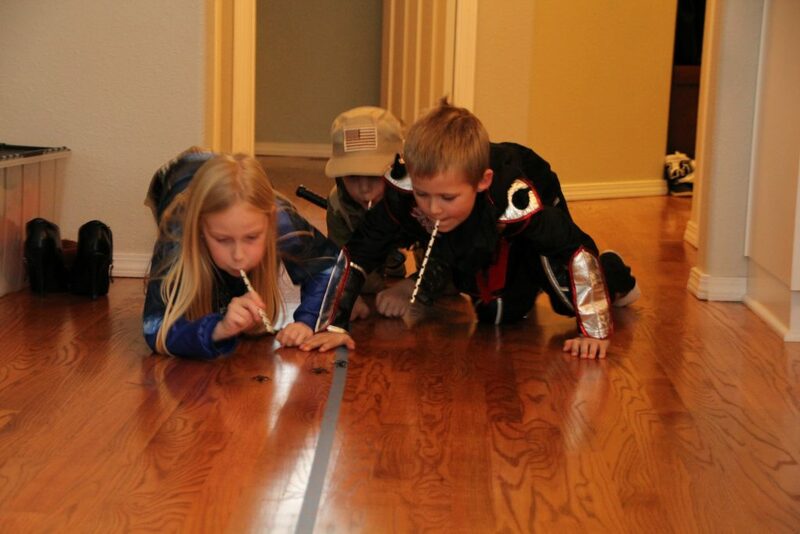 This was such an inexpensive party game and super fun to make. Around Halloween I found fun monster photo props at Target. 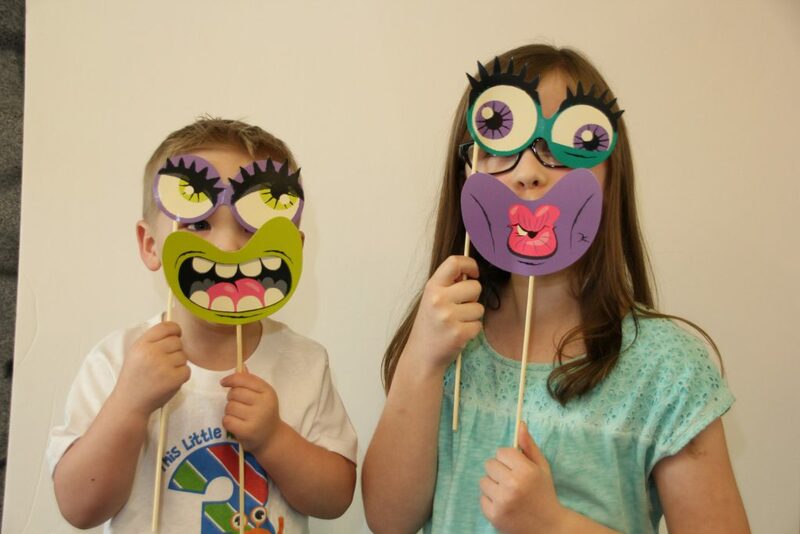 My kids always love taking photos with friends using fun props. It has become a regular activity at our parties. 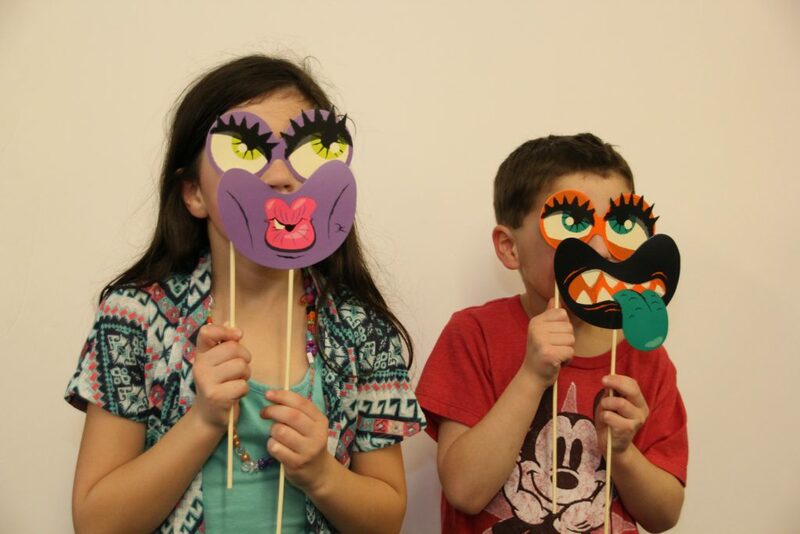 Our monster party was a big hit! I had one happy little boy. 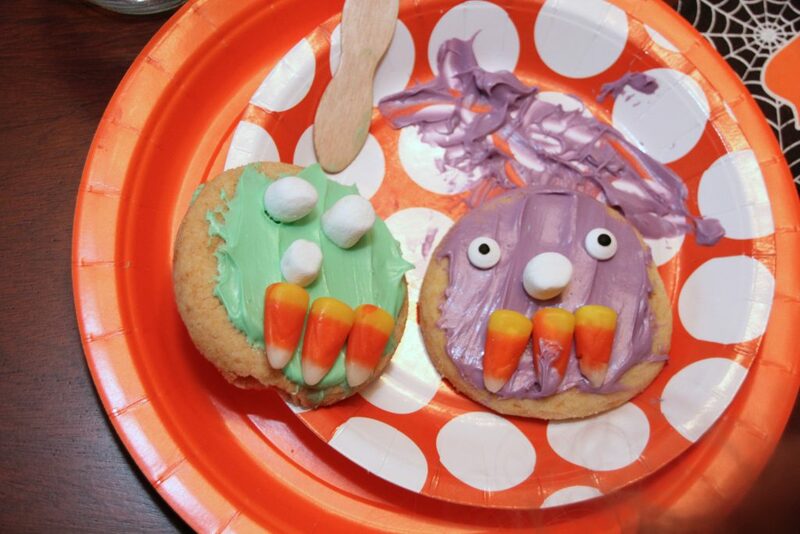 I hope you found some fun ideas for your next monster party. 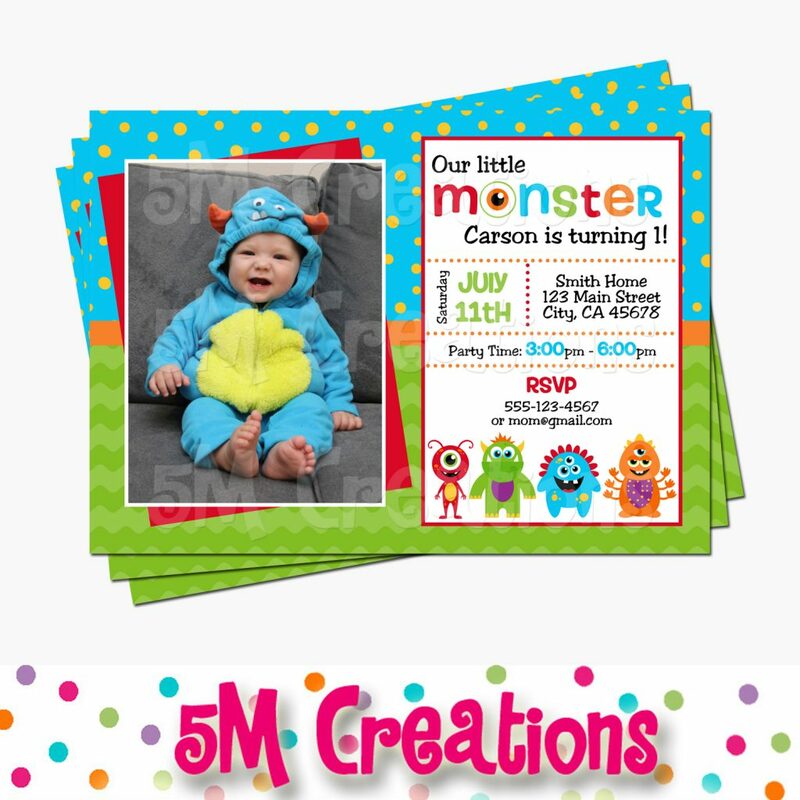 Check out the monster invitation, backdrop, and matching party décor in my etsy shop. A few weekends ago I had the pleasure of hosting a baby shower for a friend’s baby girl. She chose an elephant theme in her nursery so I went with the same theme. 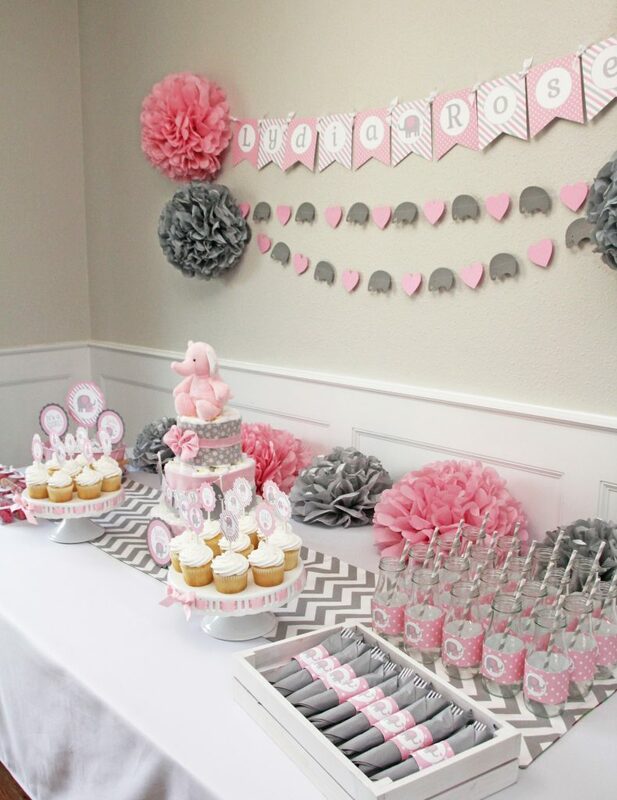 I love being able to use the nursery theme when designing a baby shower. I use decorations from the shower as a gift for the mom to be. I started this set with the base of my original boy Elephant baby shower I designed a few years ago. I swapped the colors for a soft baby pink and gray and updated some of the designs. Be watching for an updated boy version soon. 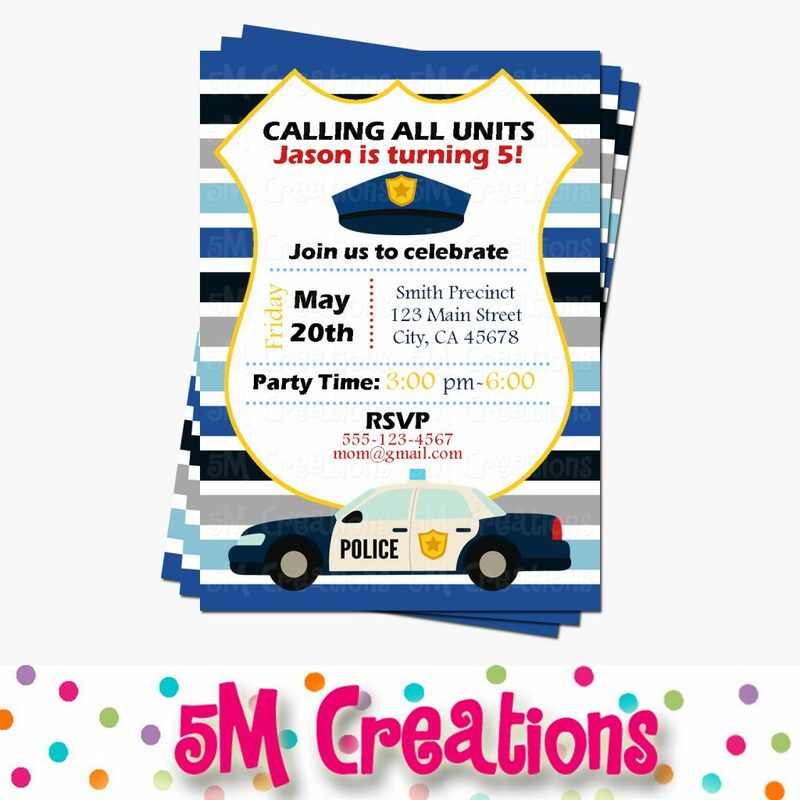 I had fun adding some layered die cut card stock elements to my printables for this party. 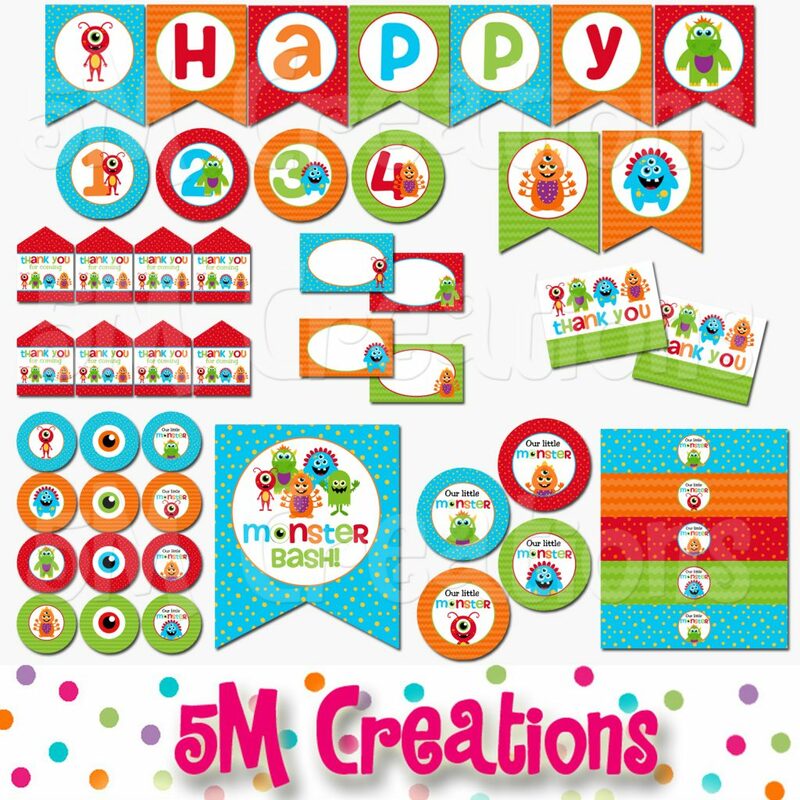 5M Creations originally began with all die cut layered party décor. It was fun to use them again. I love the mix of patterns you get with printables and the texture the layered card stock brings. 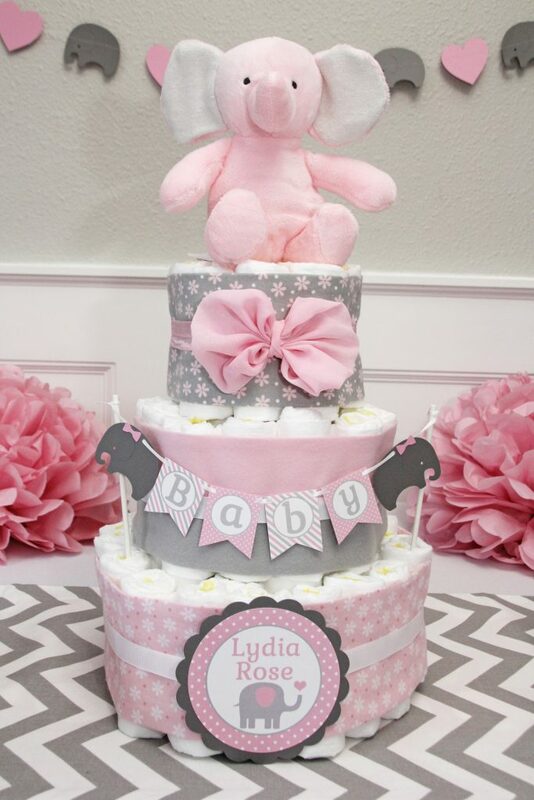 As one of the gifts for the mom to be I created this diaper cake. 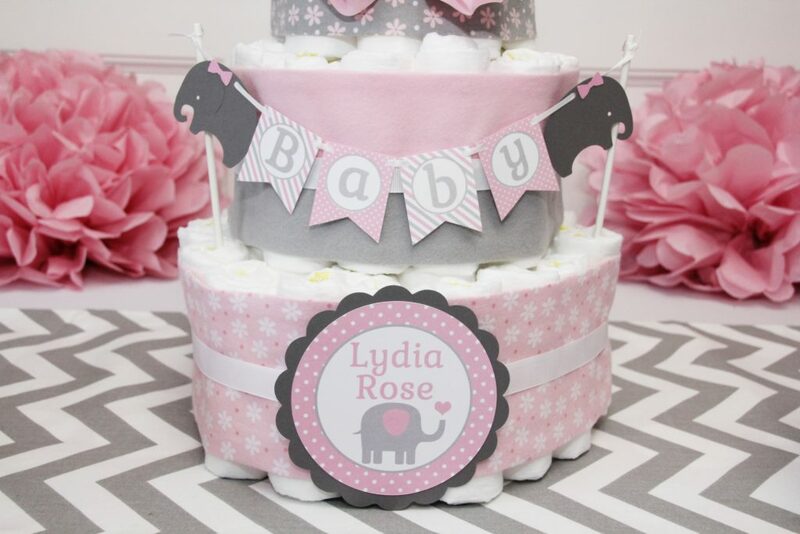 If you have never made one, it is just diapers rolled up to make each tier. I prefer Pampers Swaddlers(since they are white) in a size 1. I bought these sweet pink and gray fabrics at my local craft store. I cut them to the size I needed and secured them in the back with straight pins. You can use swaddle or receiving blankets as well if you find some that match your colors. 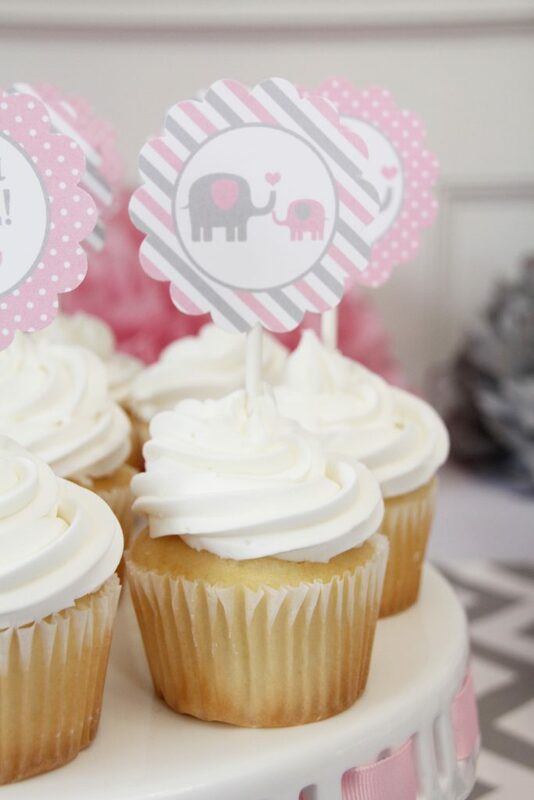 I created a mini Baby banner in this printable elephant baby shower package to use on the middle tier. I added die cut elephants to the end and secured them to lollipop sticks. I also used one our the printable centerpiece circles for the bottom tier. For the top tiers I found this adorable pink elephant plush at Target! I was so thrilled. Isn’t it the cutest. I also found a set of baby headbands in white and this soft pink bow. It was the perfect accent for the top tier. 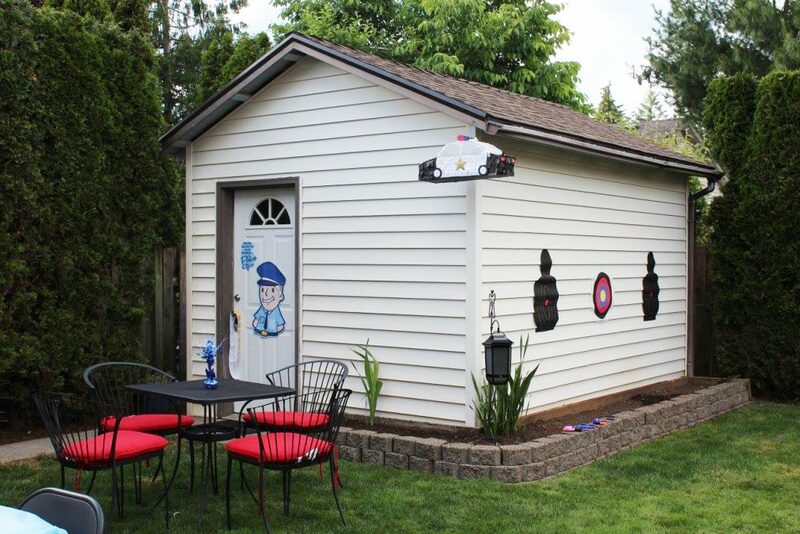 This is another way to tie in a gift for mom in your decorations. 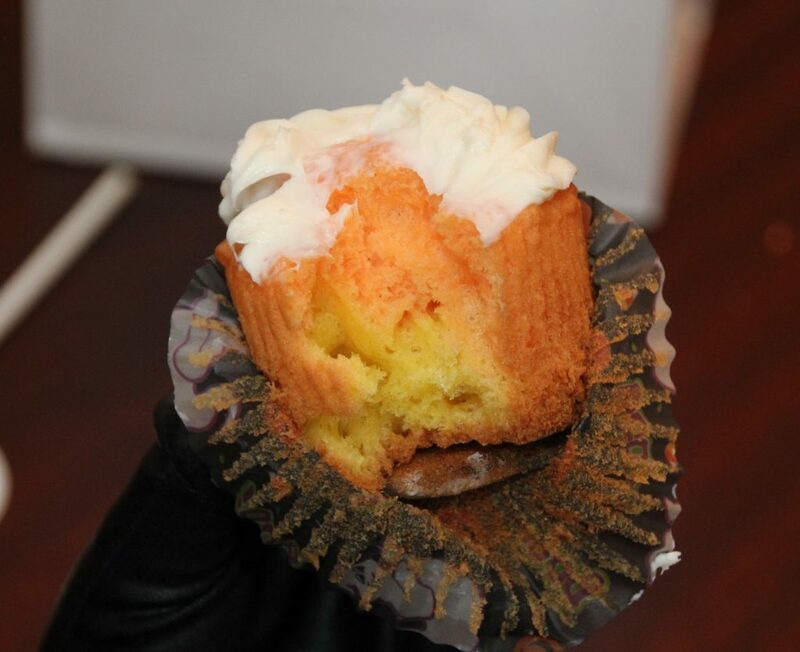 I kept the sweets simple with classic white cupcakes. 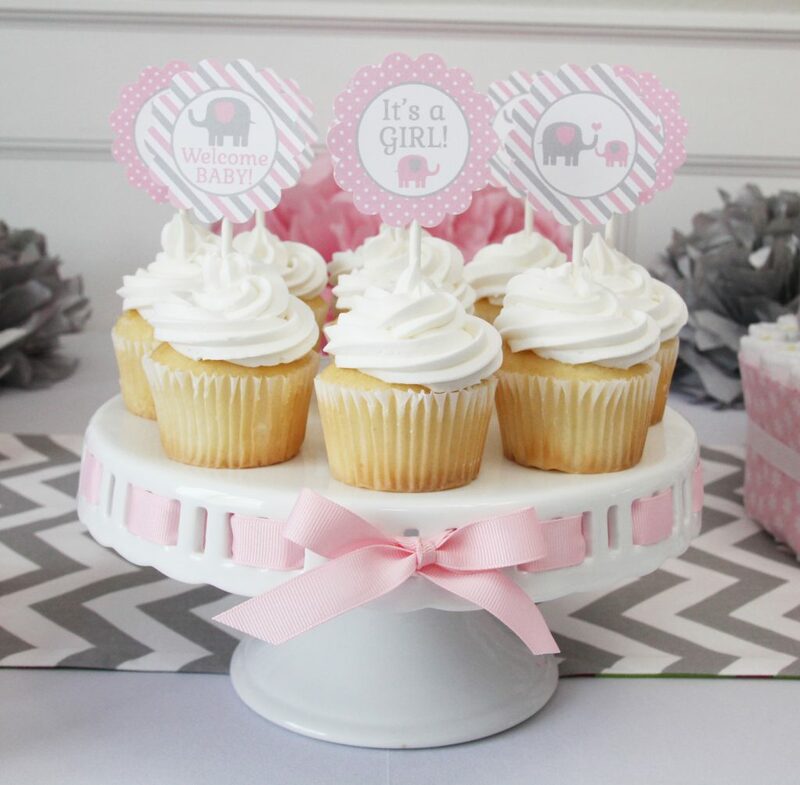 I added sweet cupcake toppers punched with a scallop punch for a girly touch. I love this cake stand from Home Goods. I can swap out the ribbon to match any theme I need. 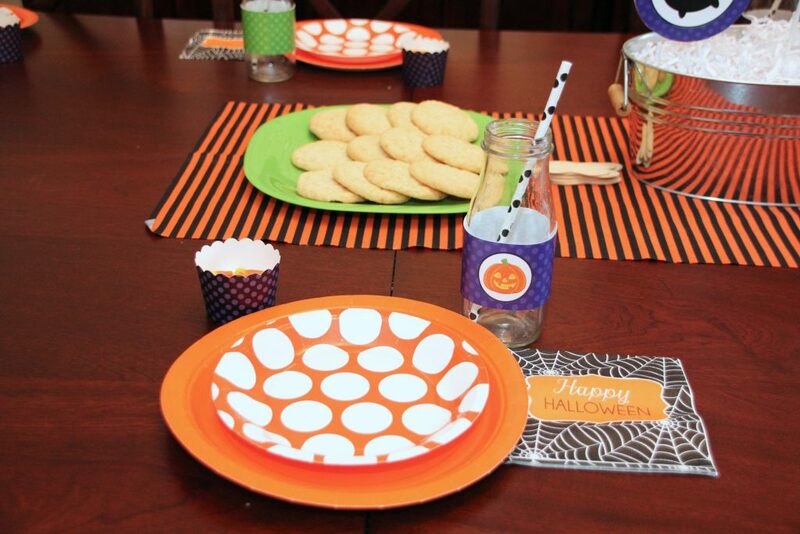 My printable elephant centerpiece circles were dressed up with an extra layer of scalloped circles behind them. Add them to a cute pink bucket and they are a perfect focal point for any table. One of my favorite drink containers to use are these glass milk bottles. I have mentioned in previous posts that I purchase starbucks coffee in these bottles and remove the labels. So much less expensive than buying fancy glassware. 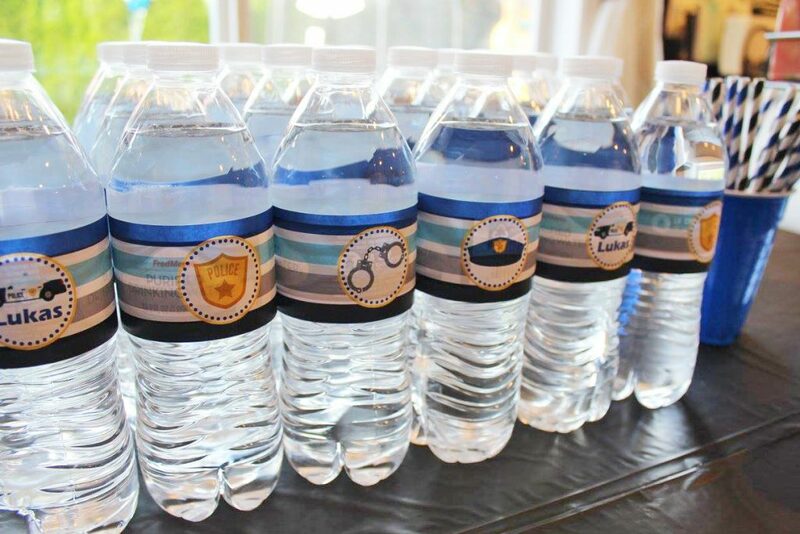 Add a cute printable water bottle wrap and a paper straw to add to any party theme. I love the little details in parties. 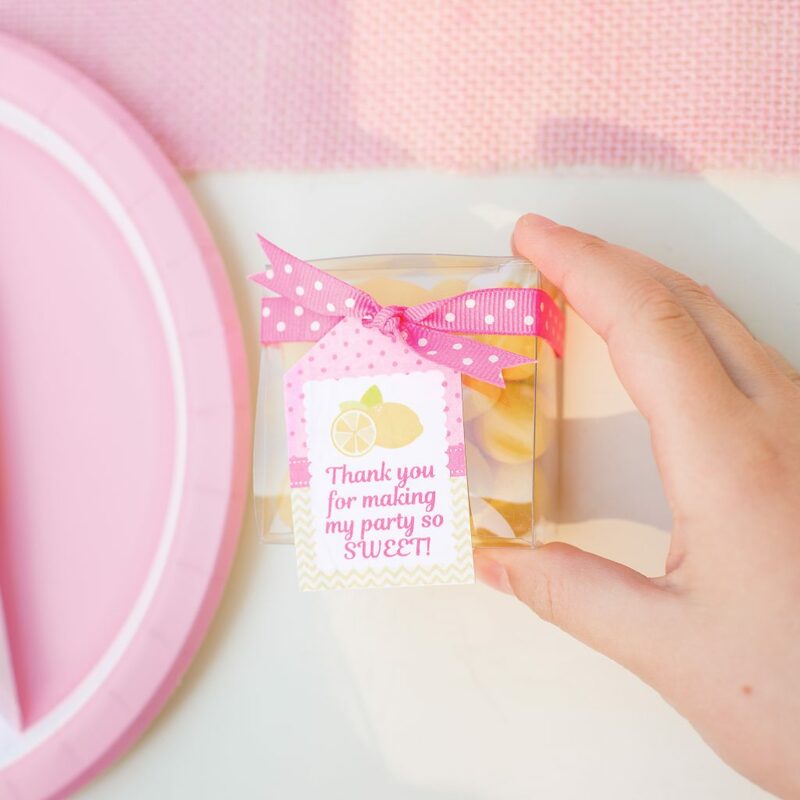 These printable napkin wraps are a perfect way to add an extra little touch of cuteness. Plain silverware and napkins become part of the décor. 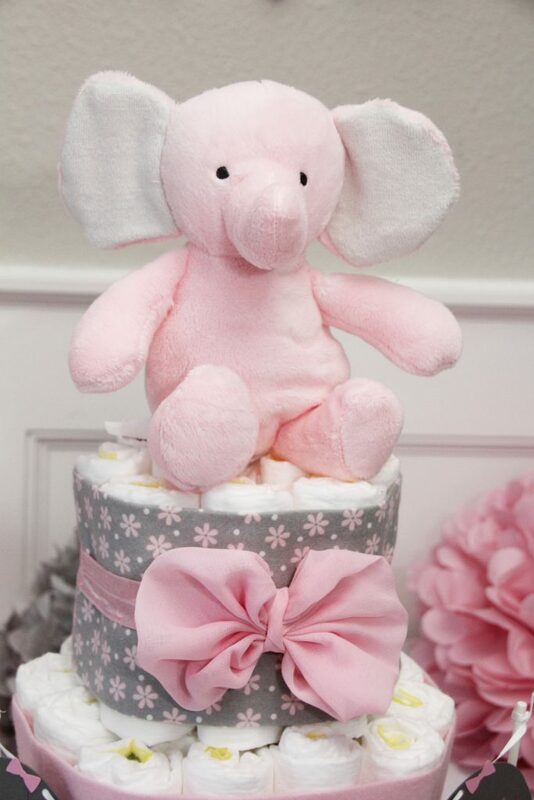 Tissue poms are such a fun decoration for a baby shower. They are so soft and whimsical. My table was very deep and I needed a way to fill the space without making it look to busy. Tissue poms were perfect. 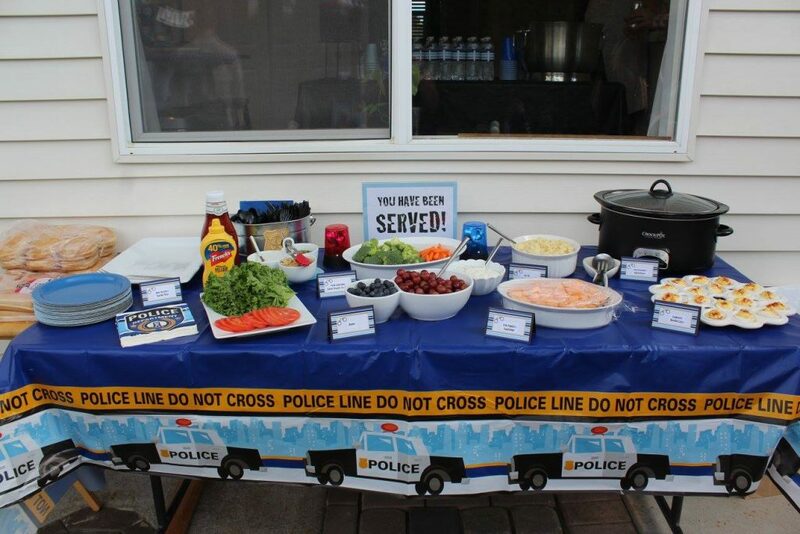 They pulled in the colors of the party perfectly while serving a purpose. I used them on the wall as well around the banners. 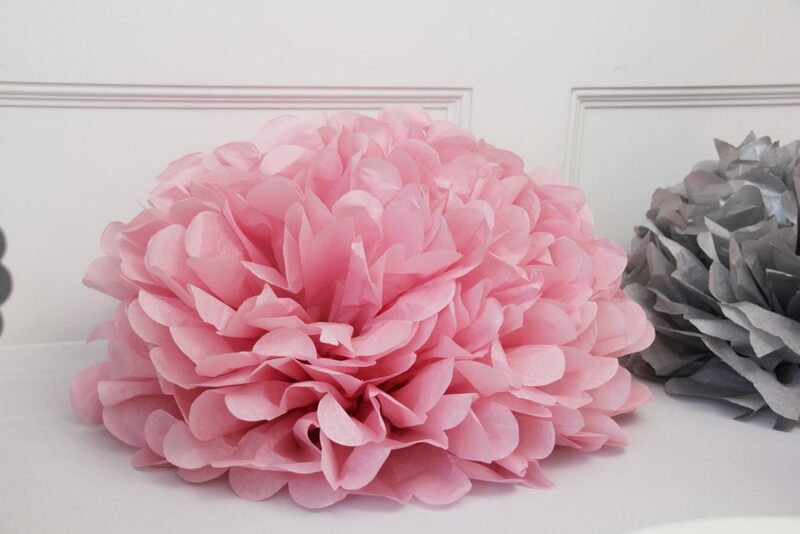 Tissue poms are such an inexpensive way to add big impact to a party space. You can find a tutorial here. 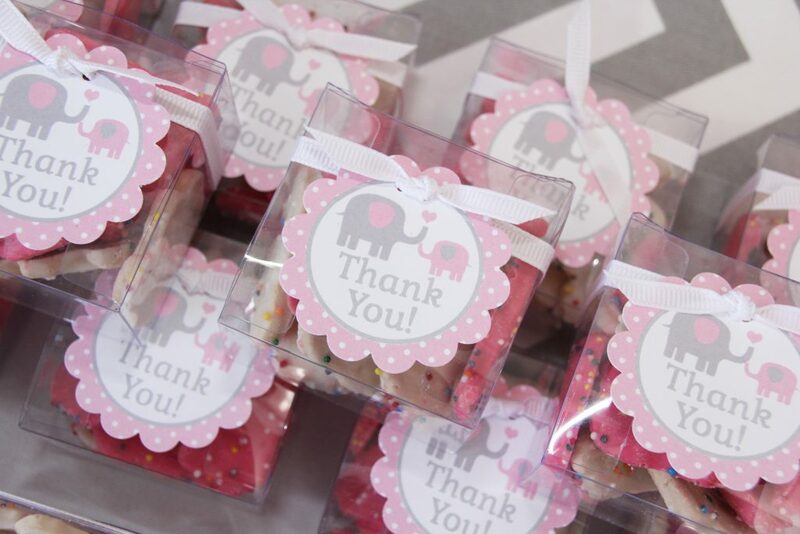 For party favors I used pink and white circus cookies in these tiny clear boxes. 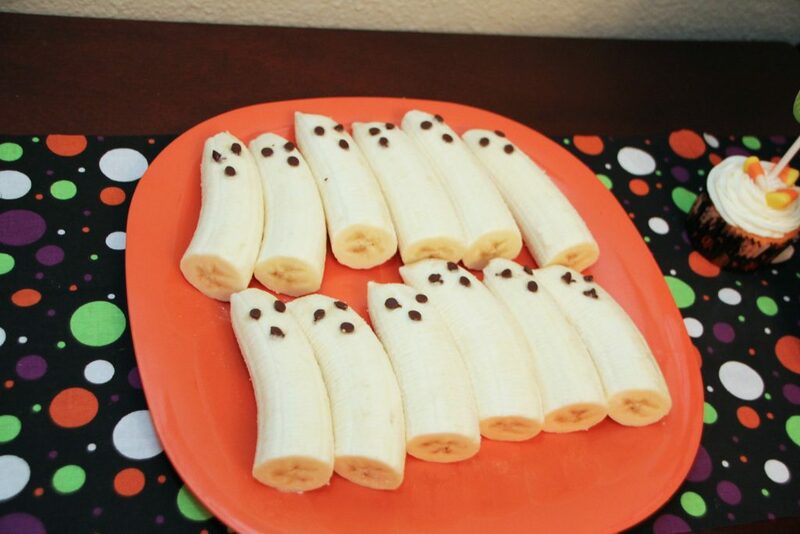 They were an adorable sweet treat to send with guests as they left. However most of them were eaten before they even got out the door. You are never to old for animal crackers. I tied a printable favor tag punched with a scallop punch to each box with a simple white ribbon. 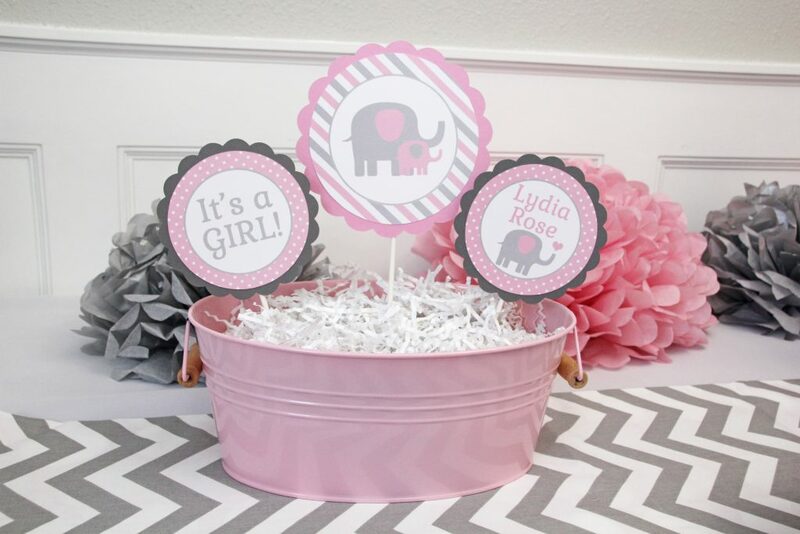 My printable elephant baby shower décor package includes an It’s A Girl banner. 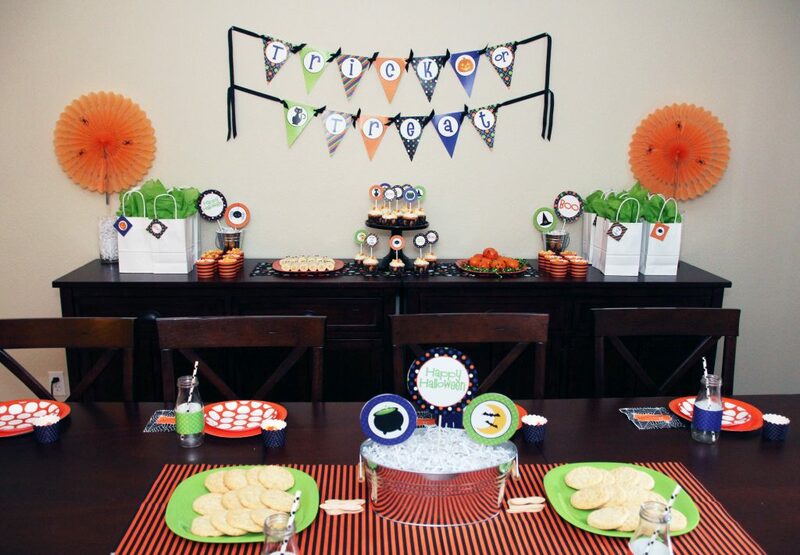 For this party I created a banner using the baby’s name so that it could be used in t he nursery as well. 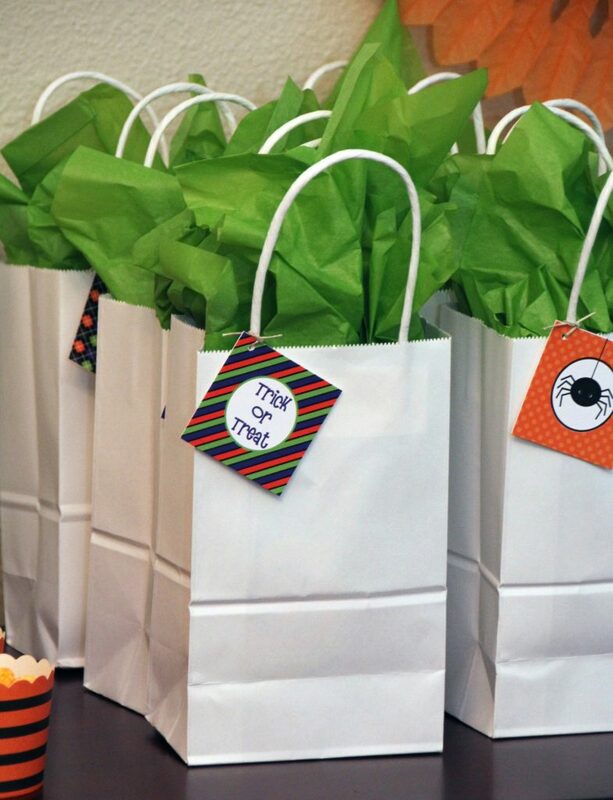 Personalization is always an option with any of my party packages. 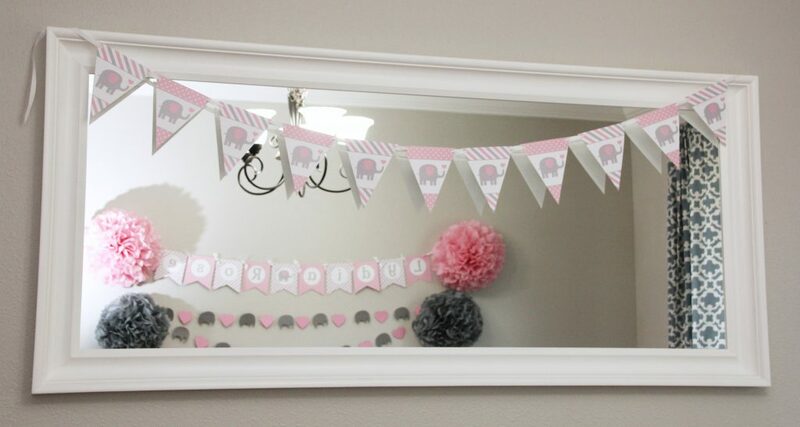 This elephant pennant banner dressed up a mirror in my party space that was over the food table. It is included in the package. As guests entered the party I had them put addresses on envelopes to make it easier for mom to send out thank you cards. I printed a set of matching printable elephant thank you cards to send with the mom as well. This sweet L was created by purchasing a wooden letter from the craft store. I traced it onto scrapbook paper and glued the paper to the letter. I added one of the die cut elephants. Decoration that doubles as a gift. Another sweet gift for mom were these blessing cards. Guests wrote messages to the baby girl. 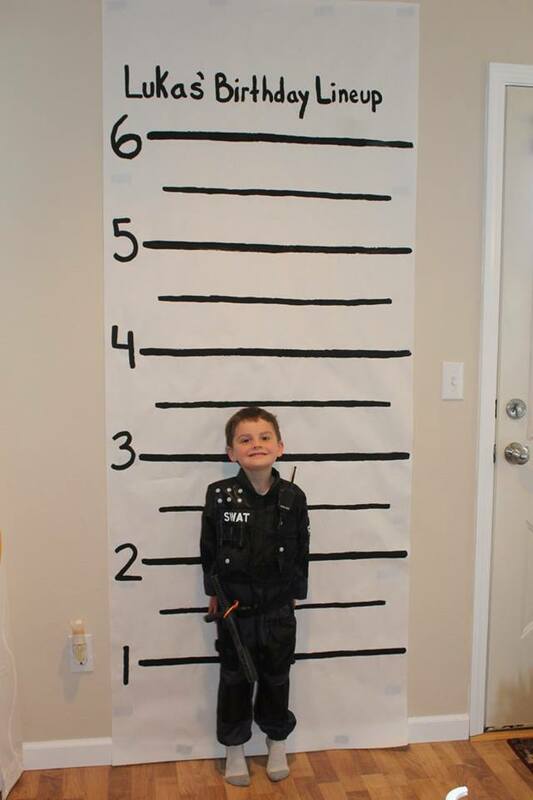 Add them to an album for a sweet keepsake to look back on years later. Last in my photo story, but really first… as guests entered they were greeted by this welcome sign. It would be adorable on a nursery door as well. I love the soft look of this pink and gray combo. It was such a fun party to design. 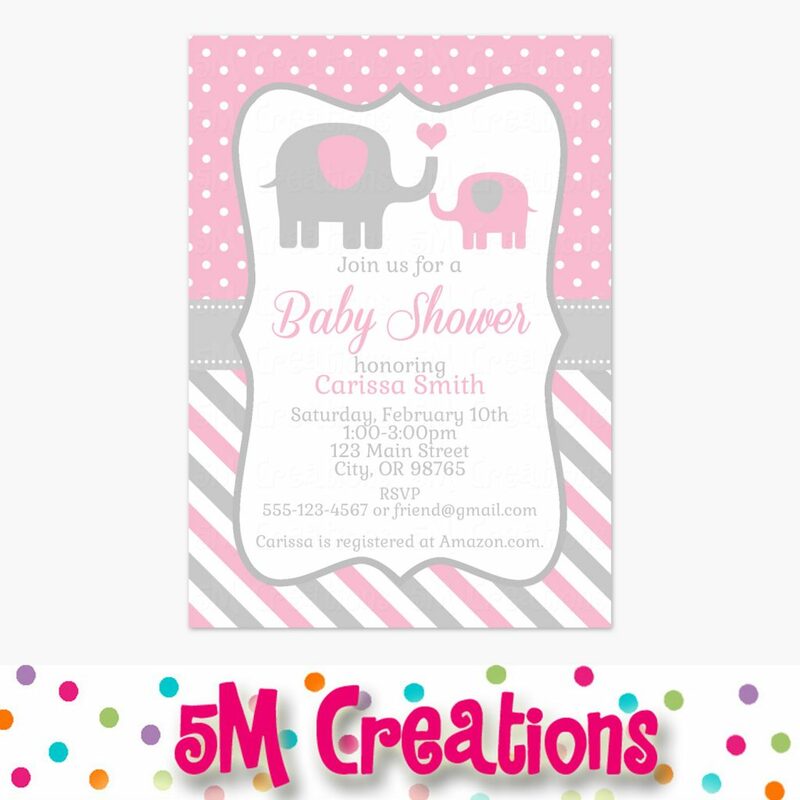 The full party décor package and printable elephant baby shower invitation are both in my shop. I hope you enjoyed this party as much as I did. 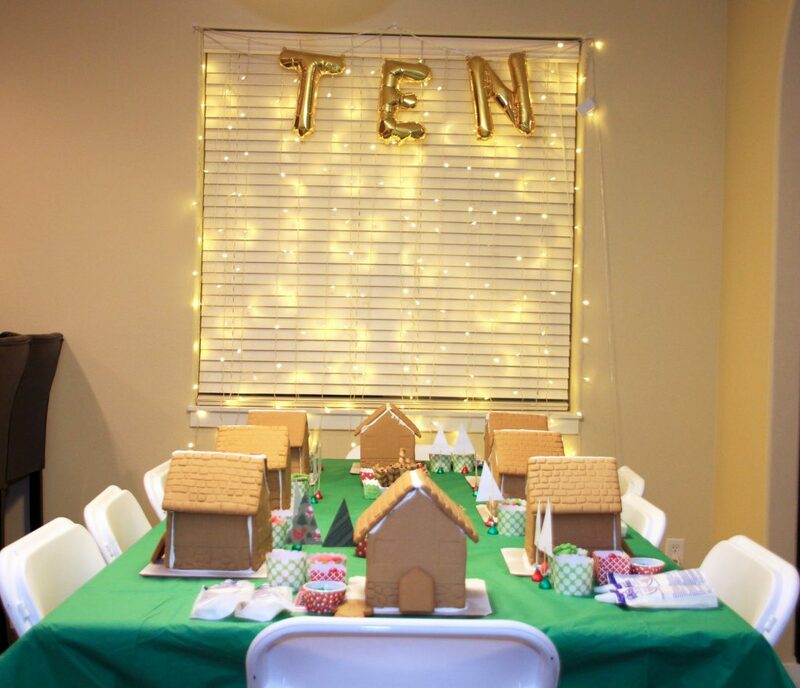 This customer gingerbread house party is so much fun! 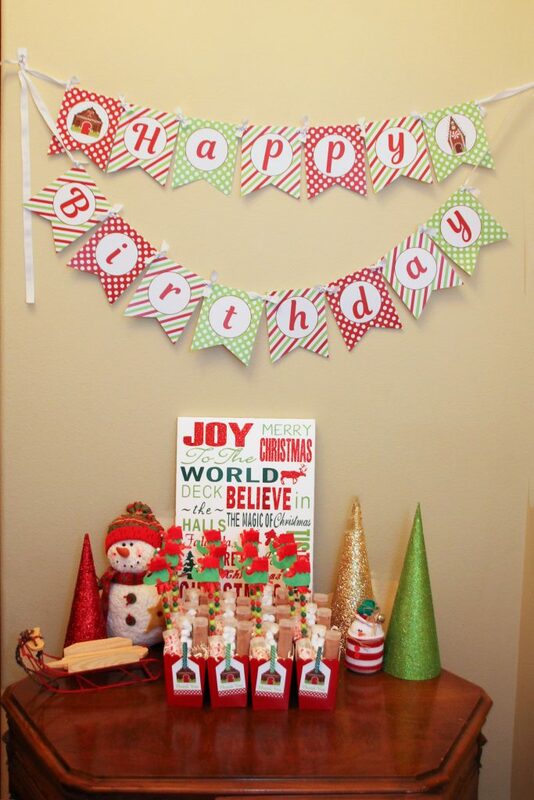 Having a December birthday lends itself to a fun holiday theme. What better choice than gingerbread! Such a classic activity for this time of year. 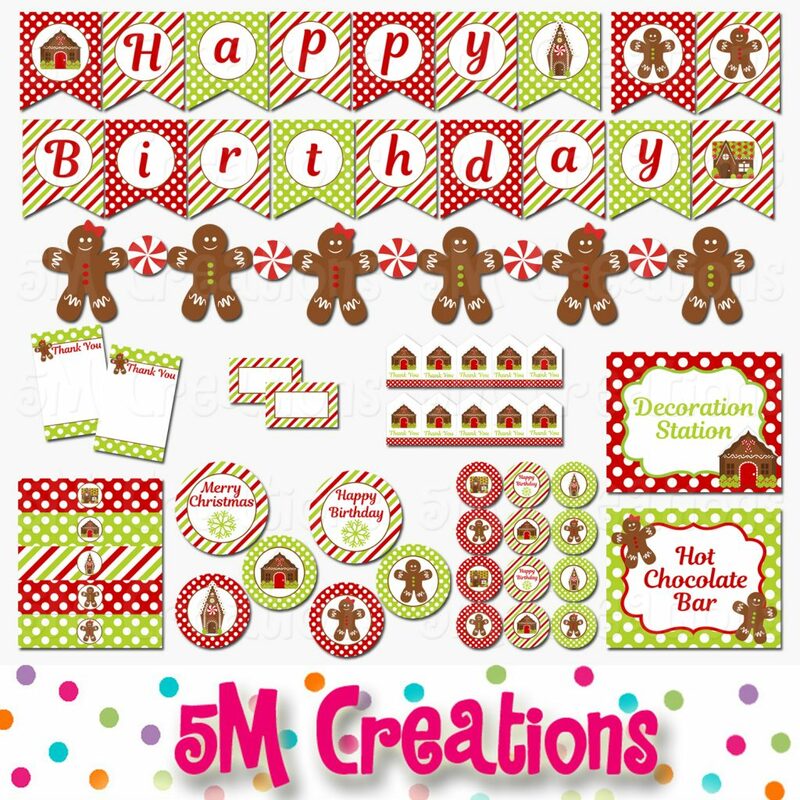 This party theme is perfect for birthday parties or a get together with friends around the holidays. 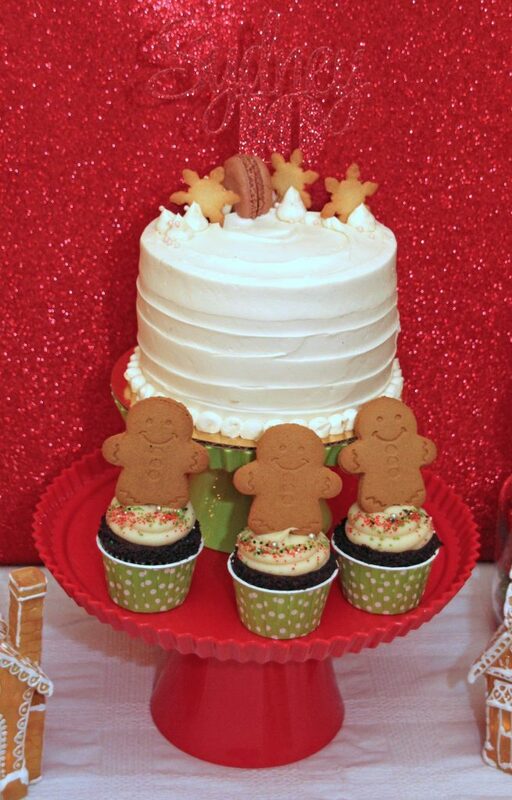 It is also great for a cookie decorating party or cookie exchange! 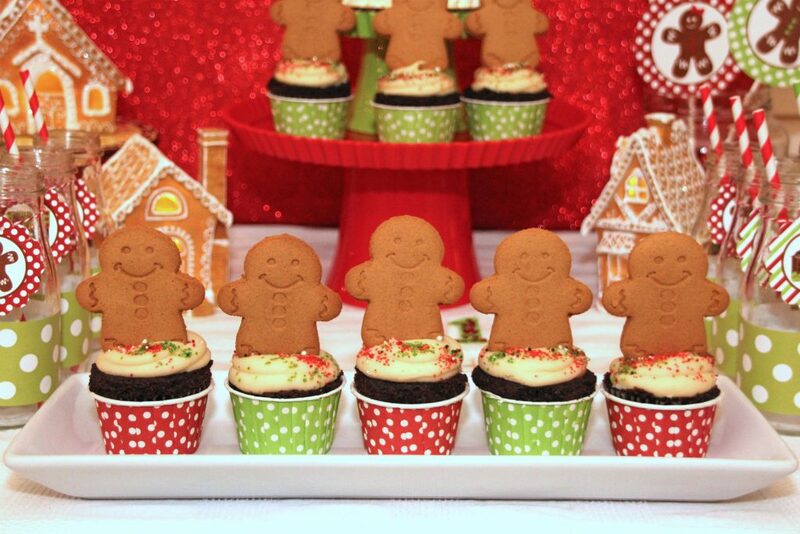 These cute little gingerbread men cookies are the perfect toppers to a simple cupcake. Add a polka dot baking cup for a great pop of color. 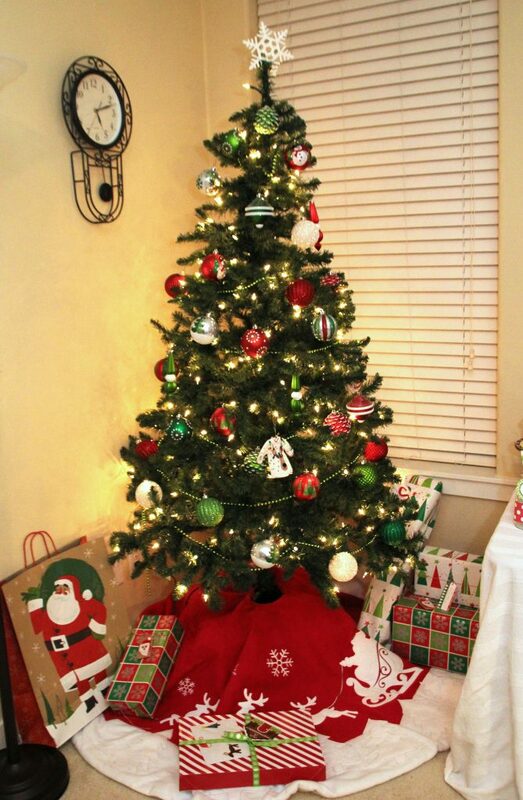 I love the use of lime green to brighten up the classic Christmas colors. A classic white cake is a perfect base to add a fun toppers or custom decor of your own. 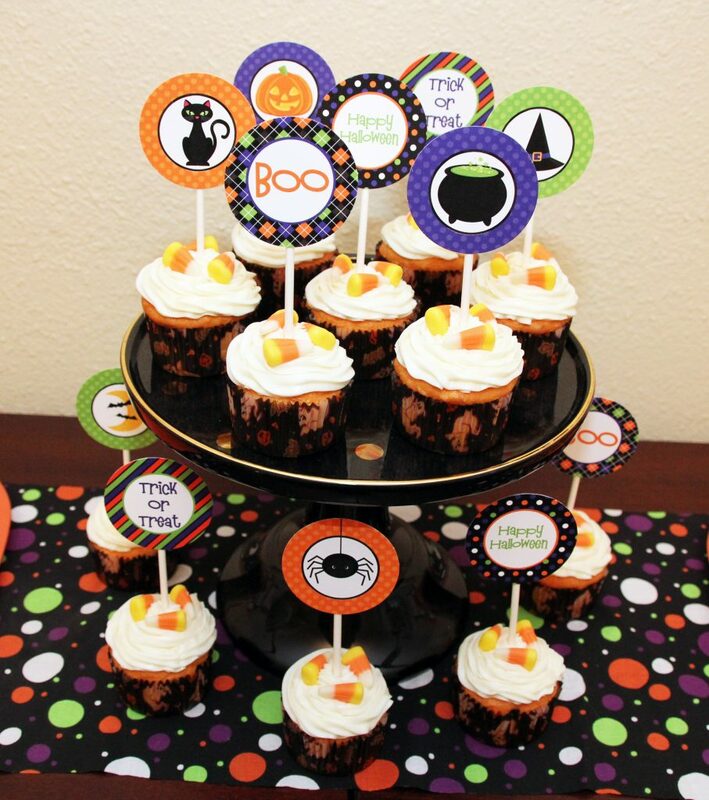 Cupcake toppers don’t have to be used on cupcakes. 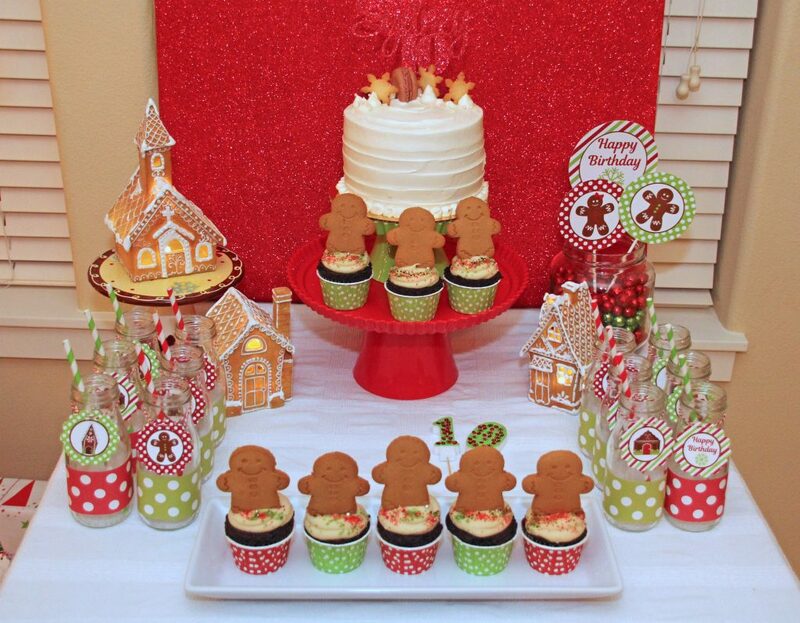 These gingerbread toppers are tied to glass milk bottles to dress up guests drinks. Paper ribbon wrapped around just adds to the look. 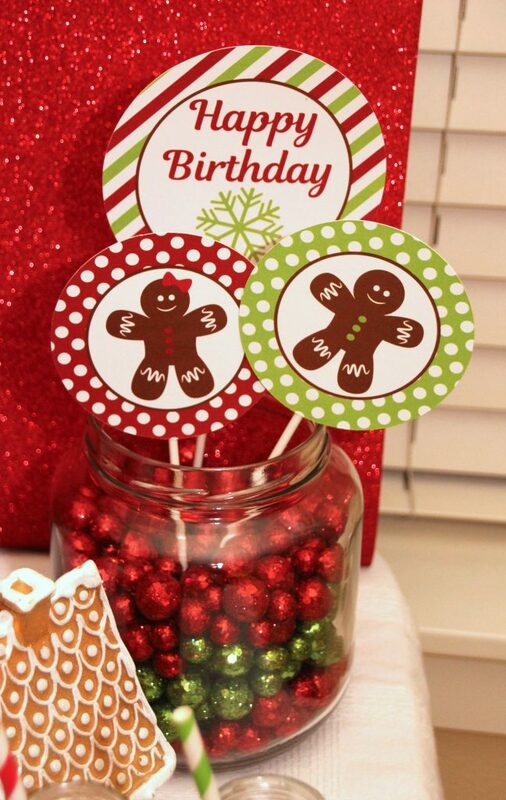 Our printable gingerbread cookie centerpiece circles can be used in so many ways. Add to any container of your choice to dress up a table. How cute are these glittery balls filling the container?!?! 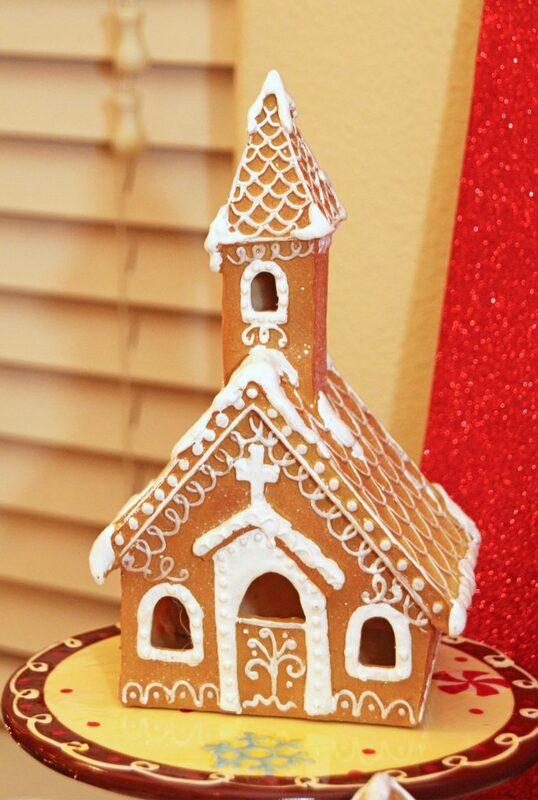 These beautiful ceramic gingerbread houses were a gorgeous addition to the table. Glittery wrapping paper covering poster board made a gorgeous backdrop for the table. The addition of the pom garland was so cute! Utilize things already in your home in your decor. 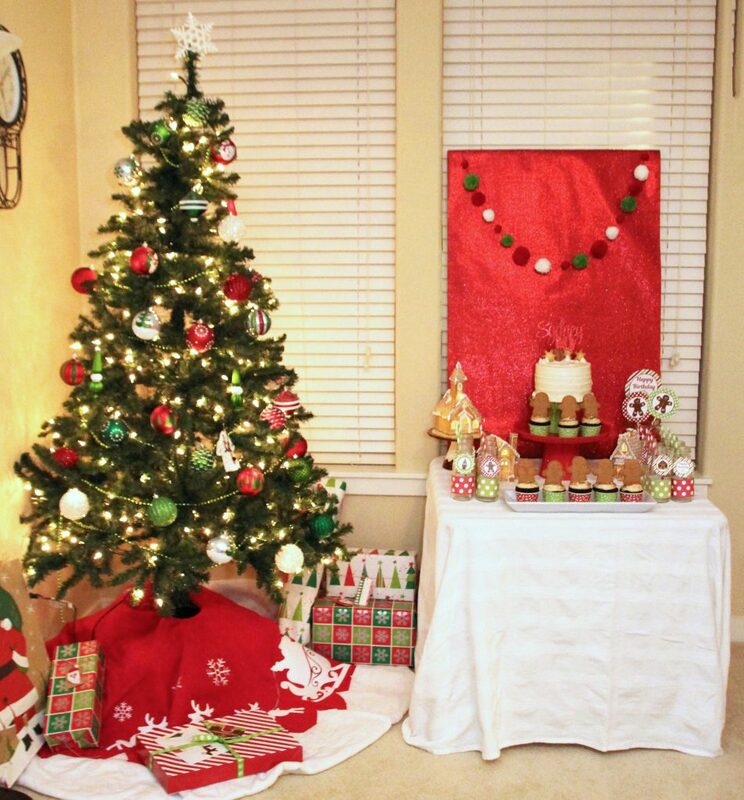 If you have a tree already up in your home make it coordinate in your party colors. 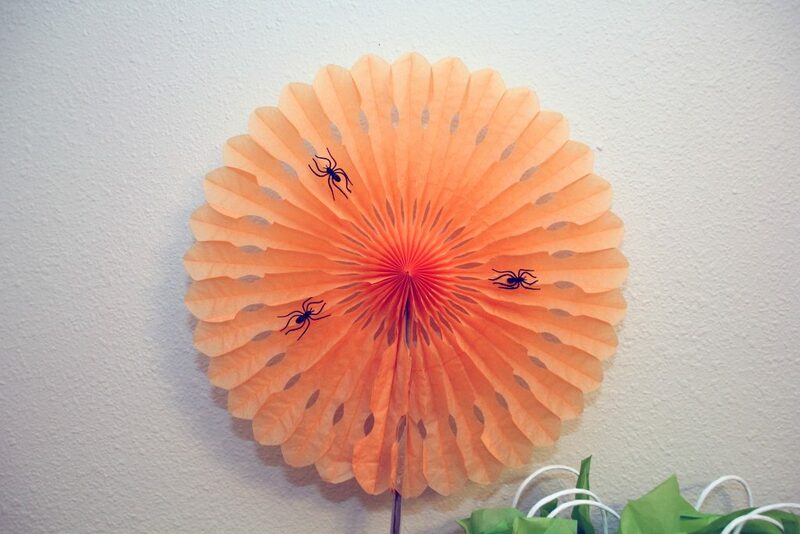 Use it to put the birthday gifts under, or maybe favors for your guests. 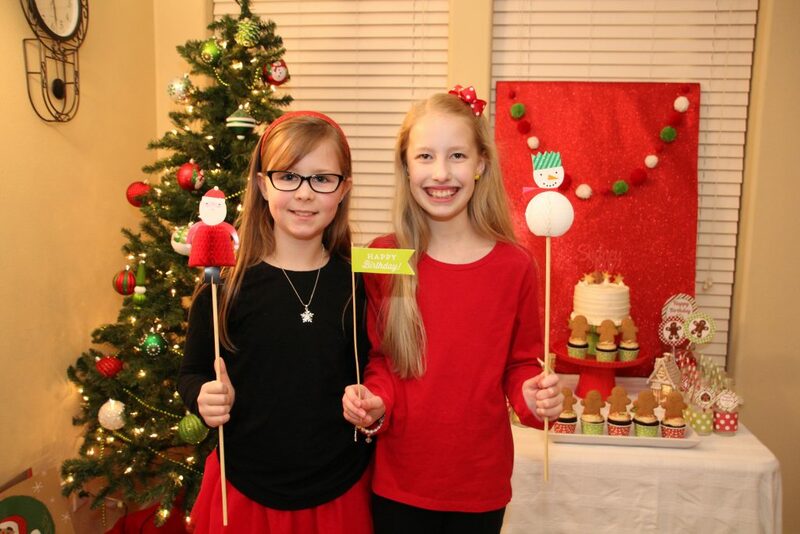 Cute photo props are always a fun activity to get photos of each guests with the birthday girl as guests arrive. 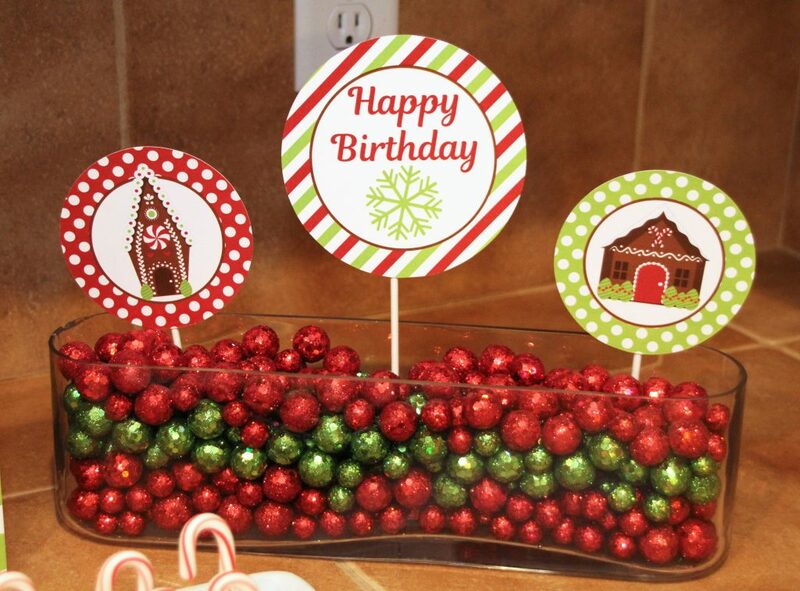 Printable peppermint candy and gingerbread cookies make a sweet garland for any table or mantle. This fabric swag garland layered with it was a great addition. 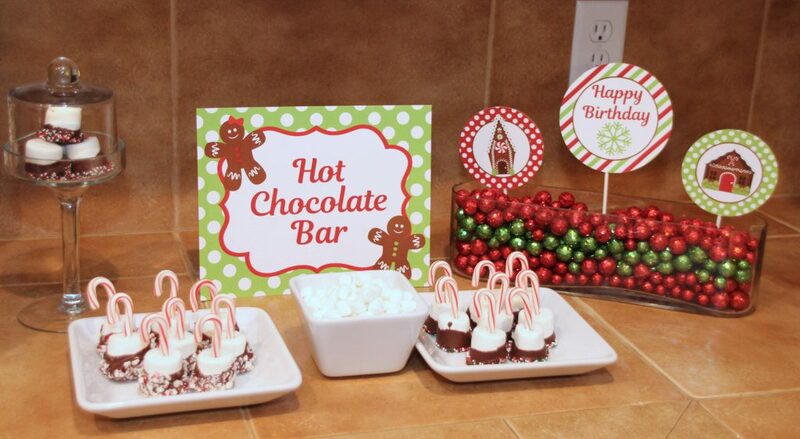 A hot chocolate bar is always delicious on a cold wintery day. I love stations where my guests can customize to their liking. 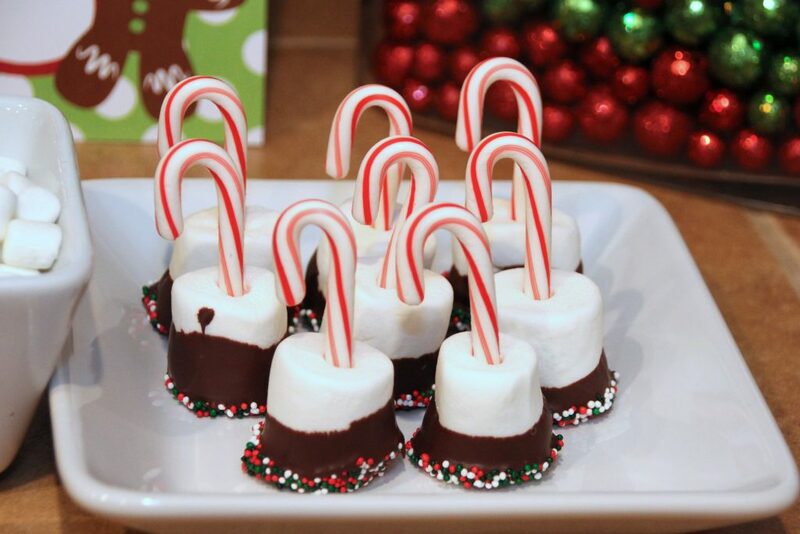 Marshmallow candy cane stir ins for the hot chocolate are yummy but also just as cute. 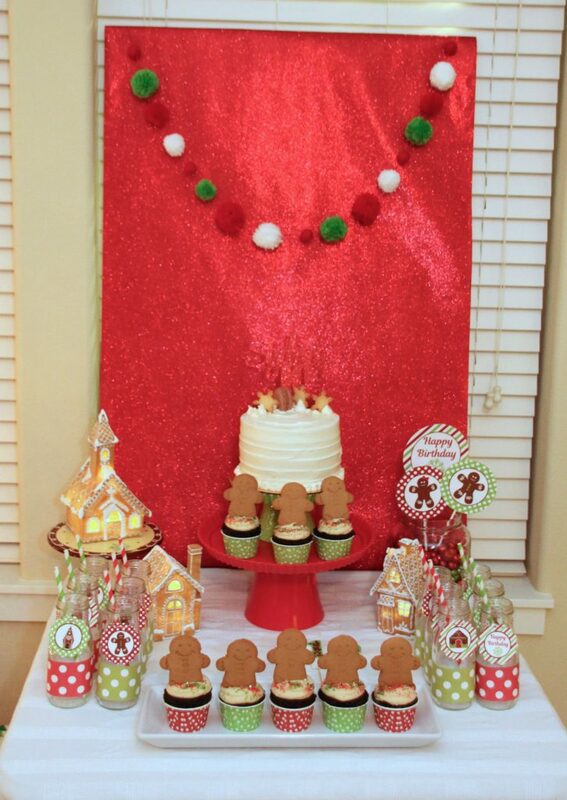 Another set of gingerbread house centerpiece circles was used to dress up the hot cocoa bar. Use containers of any shape to fit the space you need to decorate. 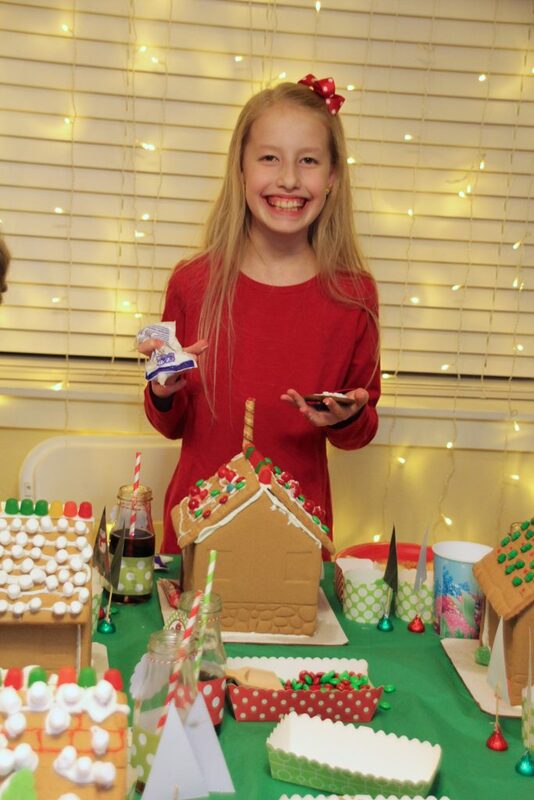 Each girl at the party got a gingerbread house to decorate. 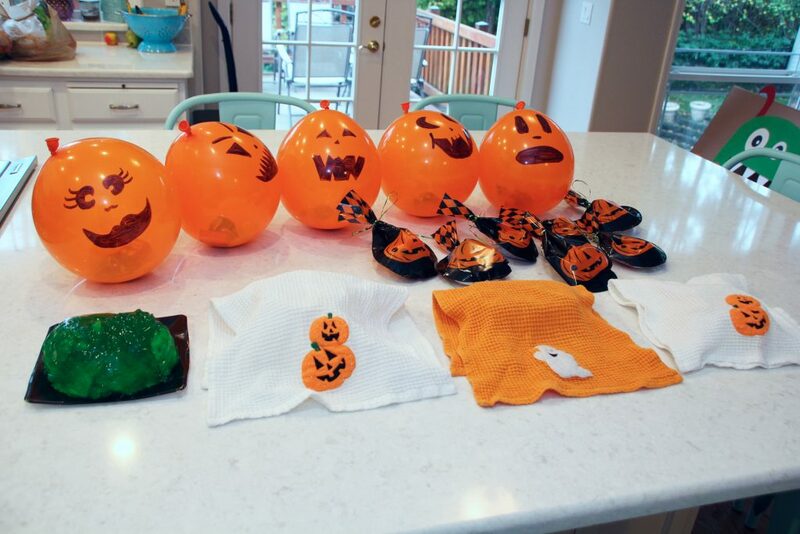 Thank you Costco Kits these cuties were pre built and came with lots of cute decorations! 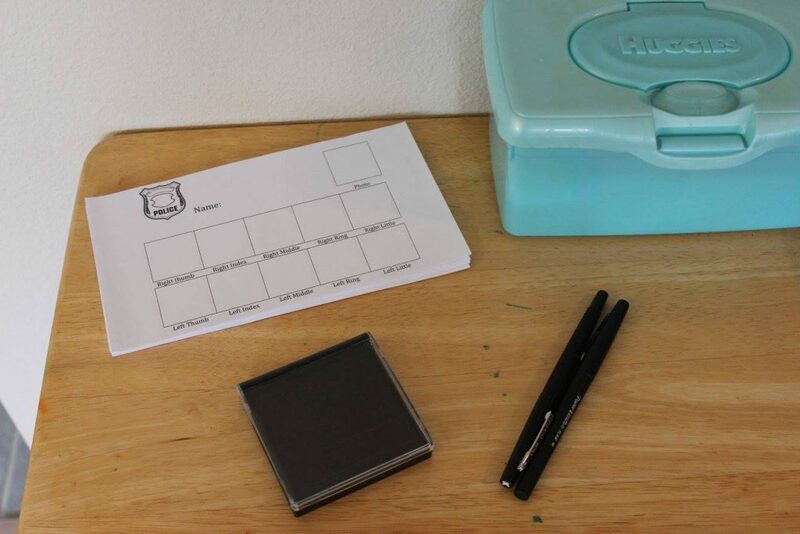 I love anyway to make my planning simpler. 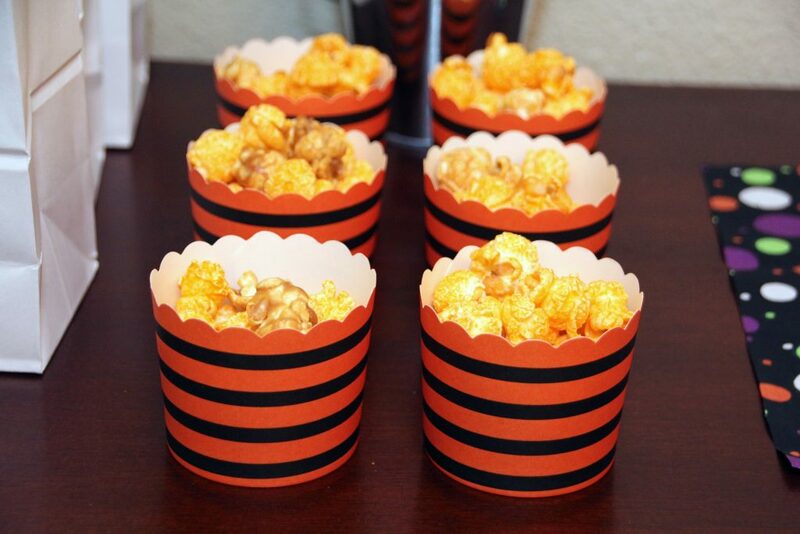 Add some of your own candy in cute cups to dress up the each guests spot. 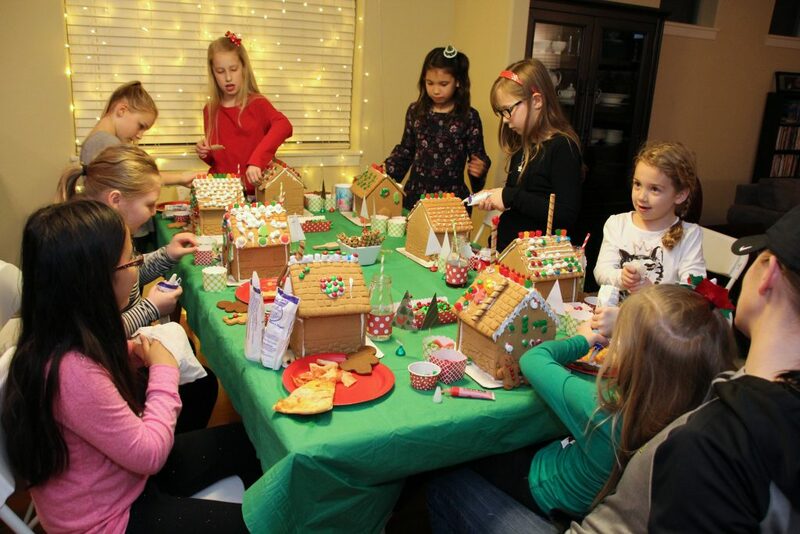 The girls had so much fun decorating their houses! Each one was so unique. 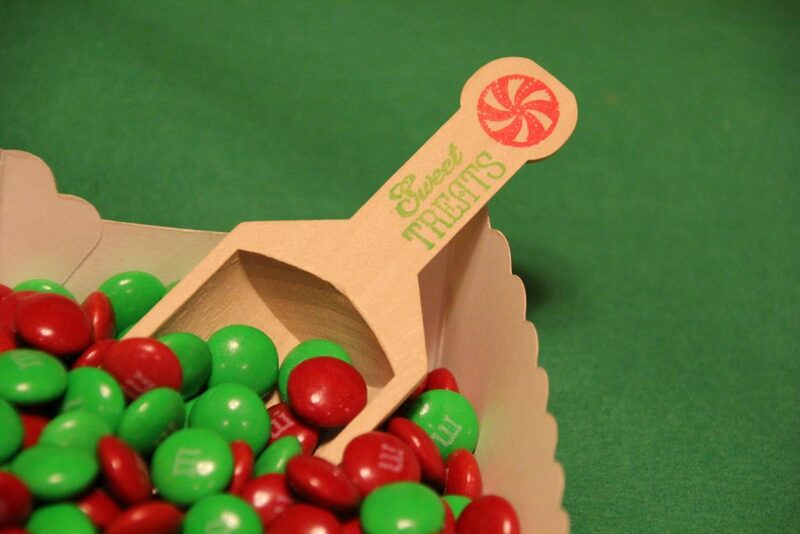 In addition to their gingerbread houses each guest took home a sweet treat for a favor. 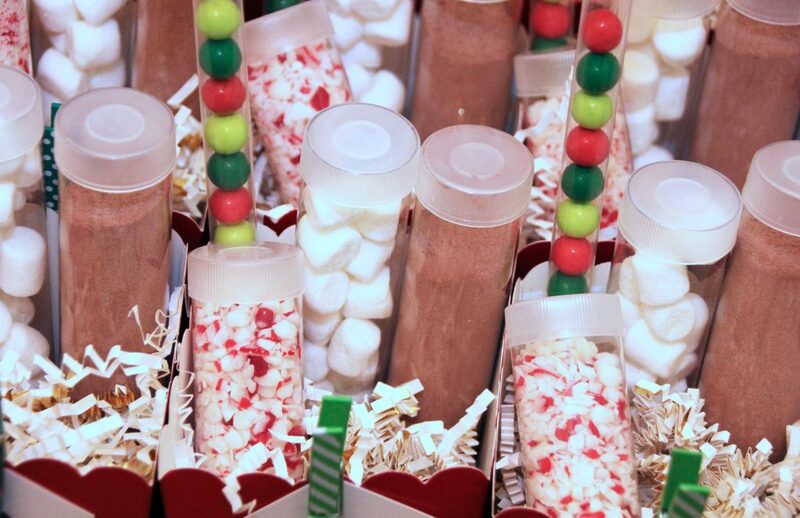 Each box contained tubes with hot chocolate, mini marshmallows, peppermint bits, and chocolate candies. 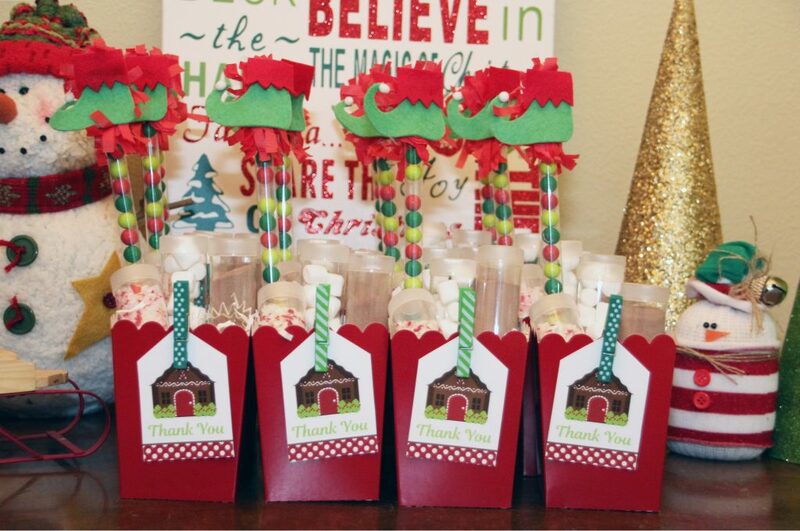 Classic red popcorn boxes were paired with our printable gingerbread house favor tags for the perfect party favor. The adorable elf show candy wands are created by the awesome Lisa Frank. 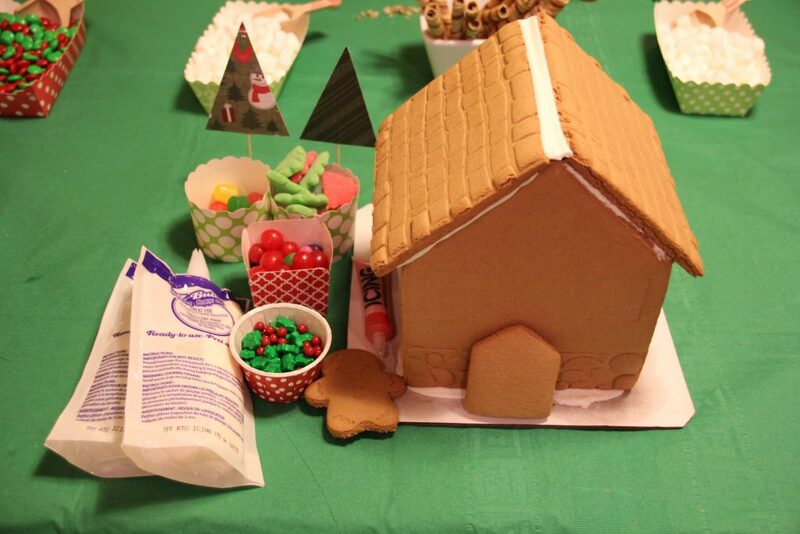 How would you use our gingerbread party line? Available as a birthday and coming soon for Christmas parties! 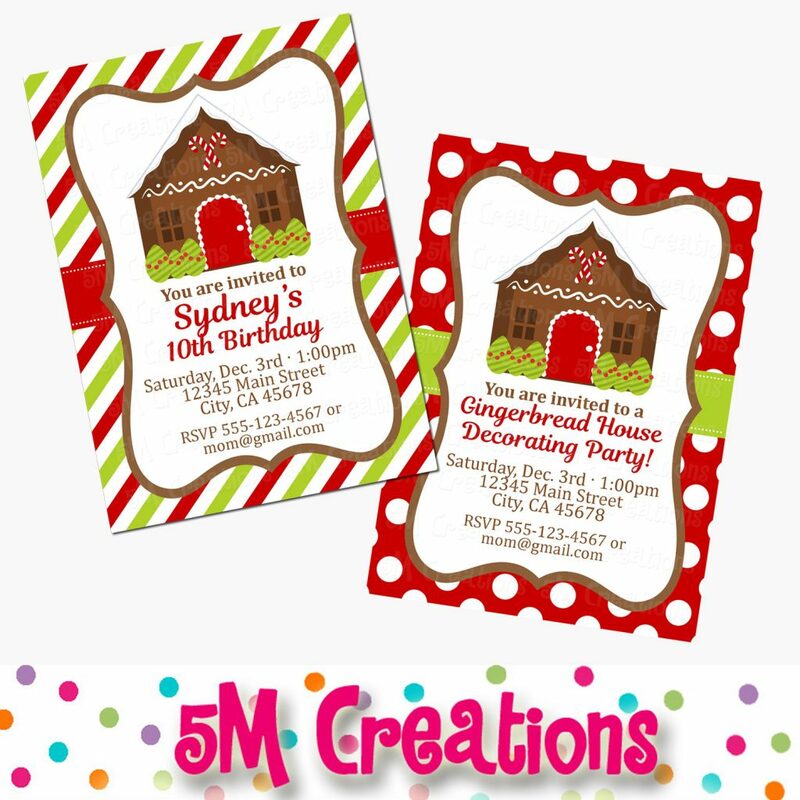 Matching invitations are available as well in both gingerbread house and gingerbread cookies! 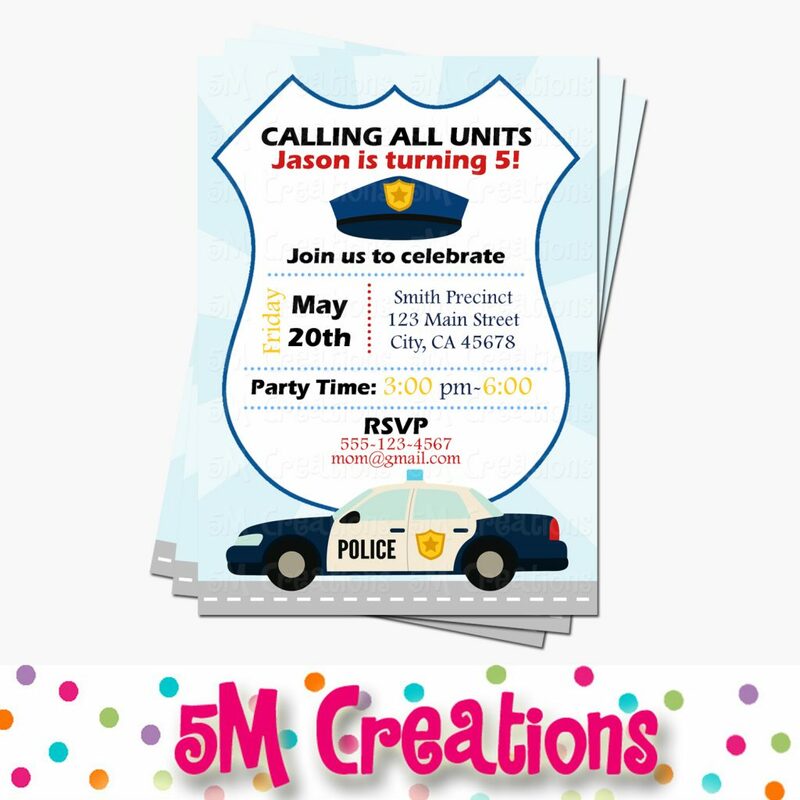 I can customize the wording to meet your party needs. Months ago my friend Dara and I made a long drive to Hobby Lobby. It is almost 2 hours from our homes. If you are lucky enough to have ever gone to a Hobby Lobby you know why we went. We found so many fun things. 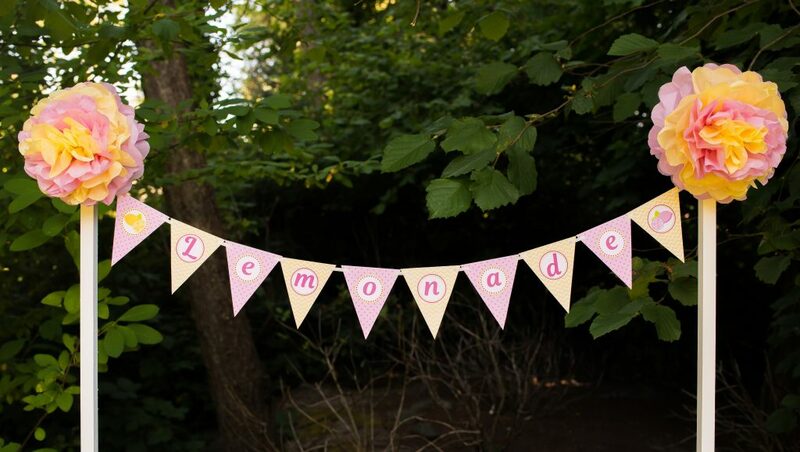 We came across some adorable lemonade decorations. 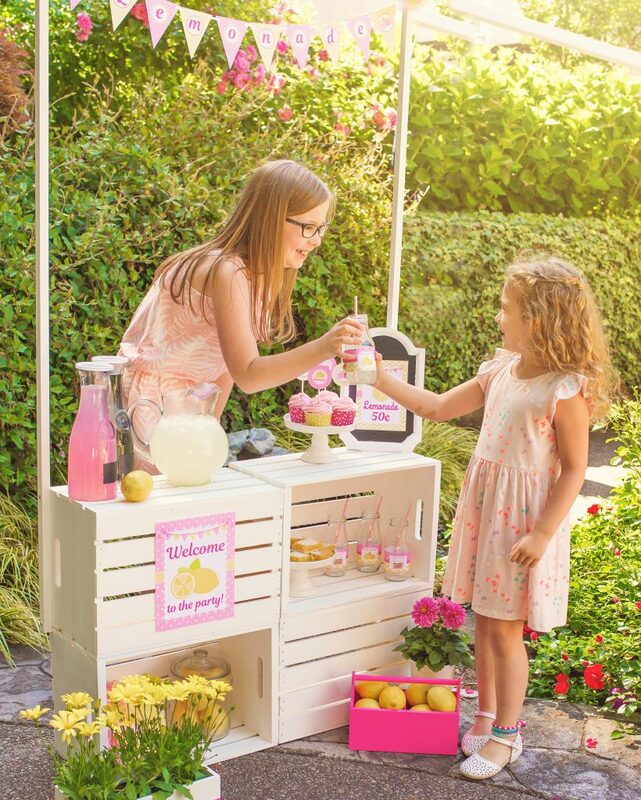 I mentioned to her that I have always wanted to do a lemonade party. It has never happened as my daughter has a December birthday. 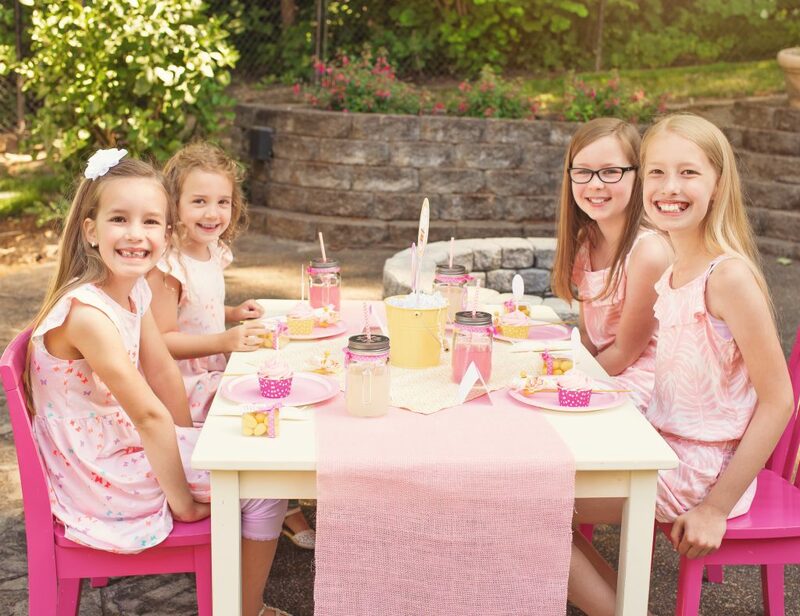 We decided to have a little lemonade party with 4 sweet friends. What a perfect thing to do on a summer day. 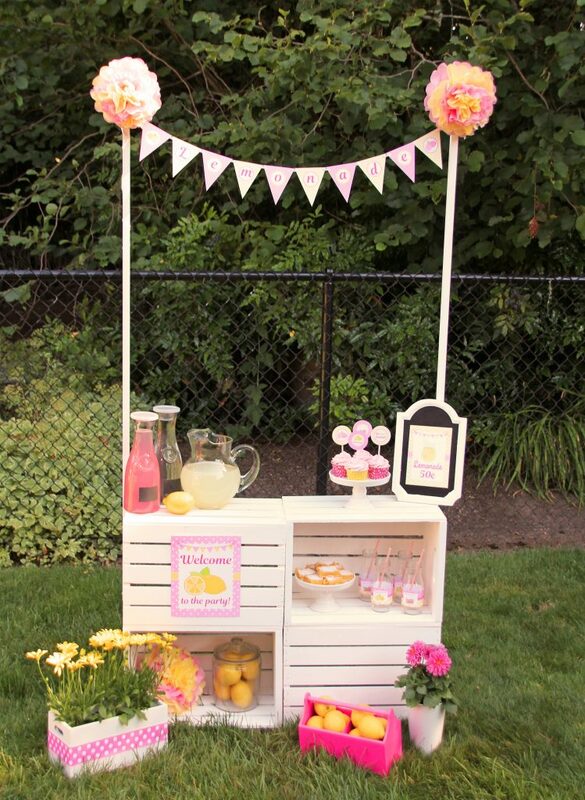 Dara found a great photo of a lemonade stand made from crates on pinterest. She went to work and created the most adorable stand. It was perfect for all of the party decor. We set up the stand in my backyard. The shelves on the stand gave us places to add lots of lemon accents. 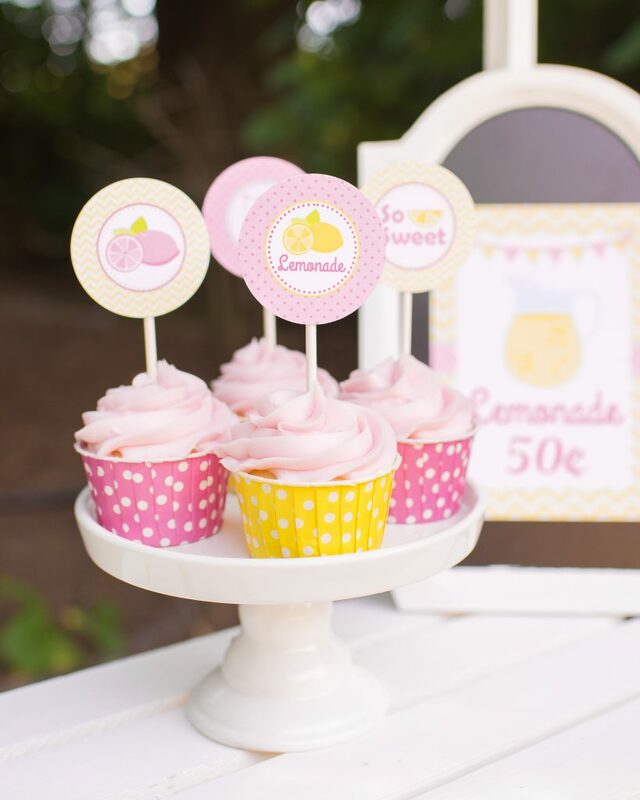 The top of the stand features my printable lemonade banner and these mini poms. 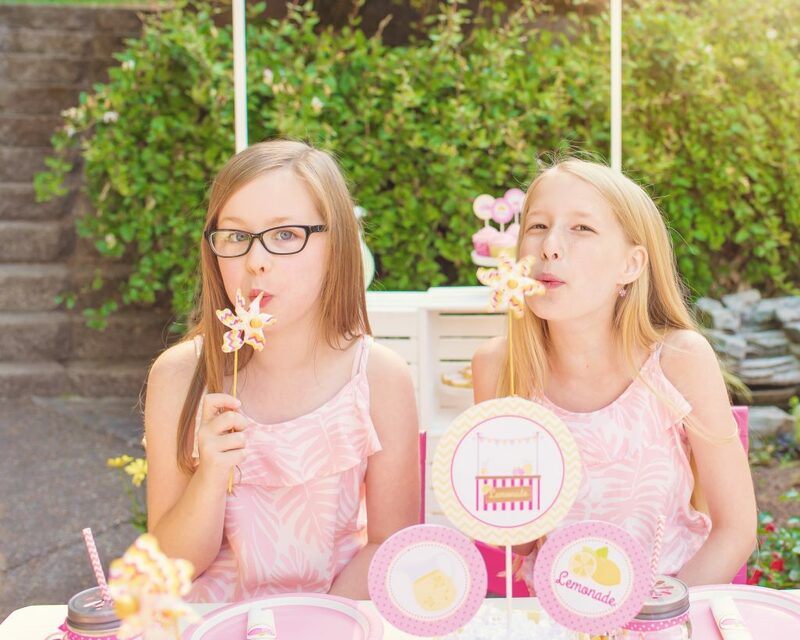 We served adorable pink cupcakes and lemon bars for our party treats. 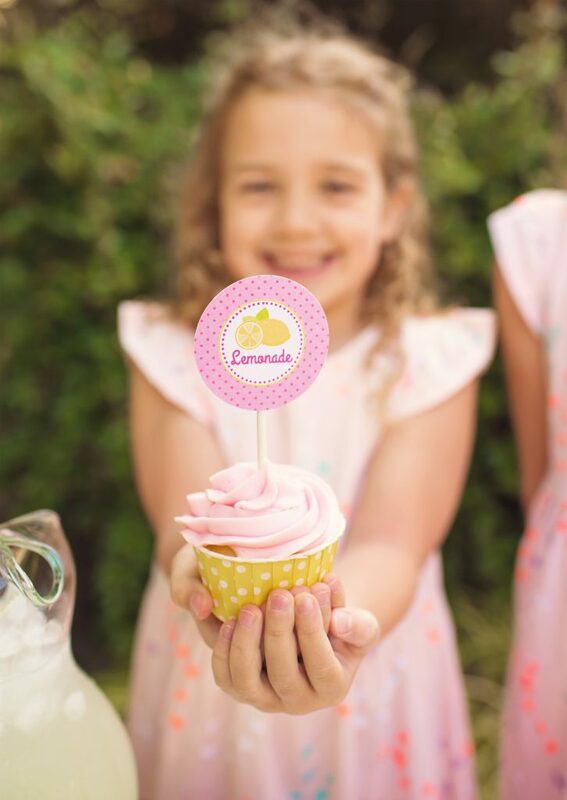 Dress up a store bought cupcake with a polka dot cup and printable lemonade stand cupcake toppers. 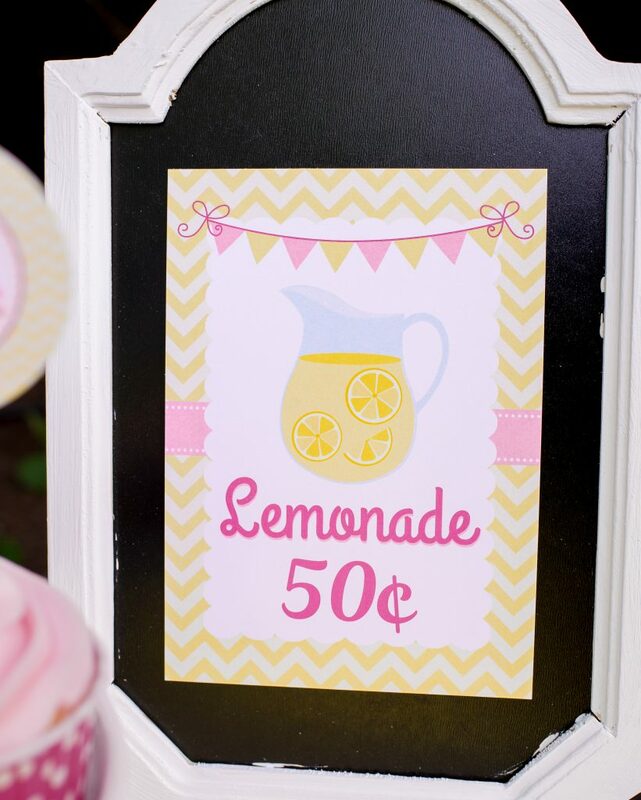 A cute chalkboard sign was the perfect frame for a printable lemonade sign. 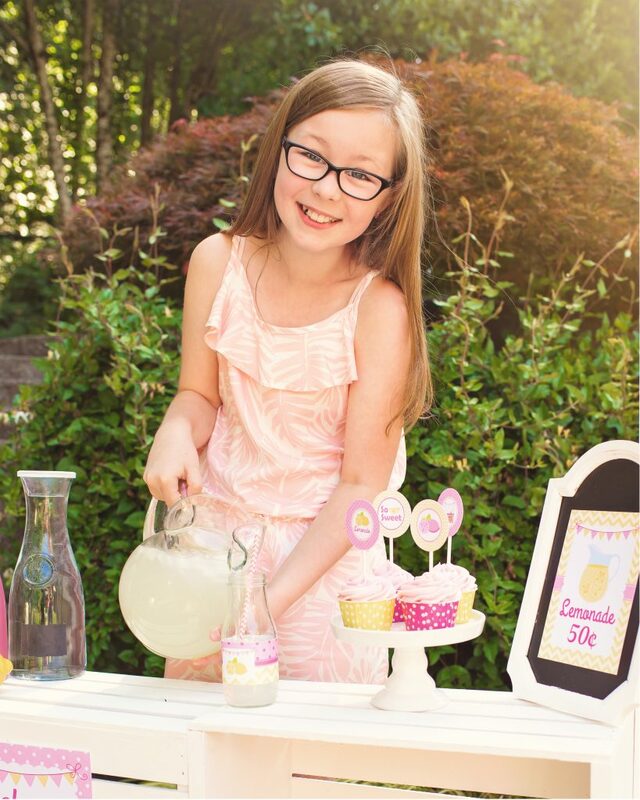 Every lemonade stand needs to tell customers how much each glass costs. 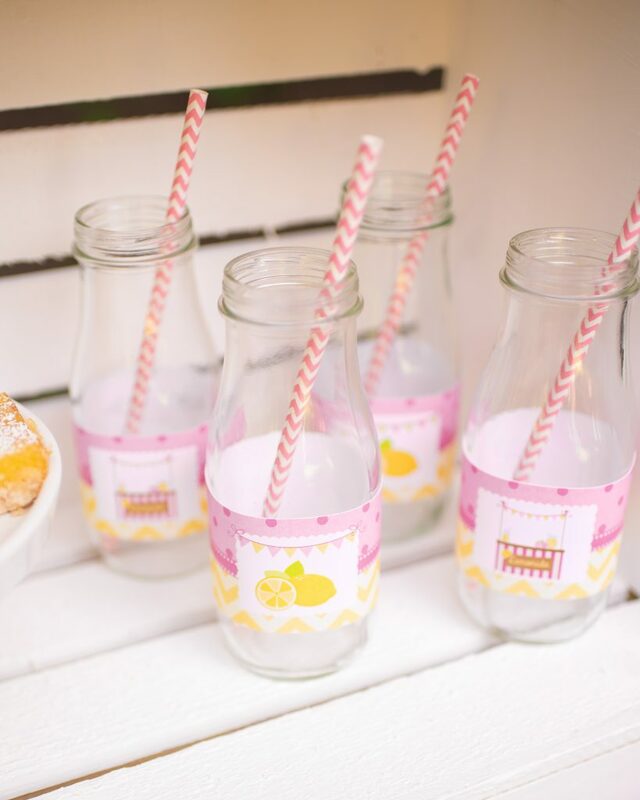 Clear glass milk bottles wrapped in my printable lemonade water bottle labels created the cutest drink containers. 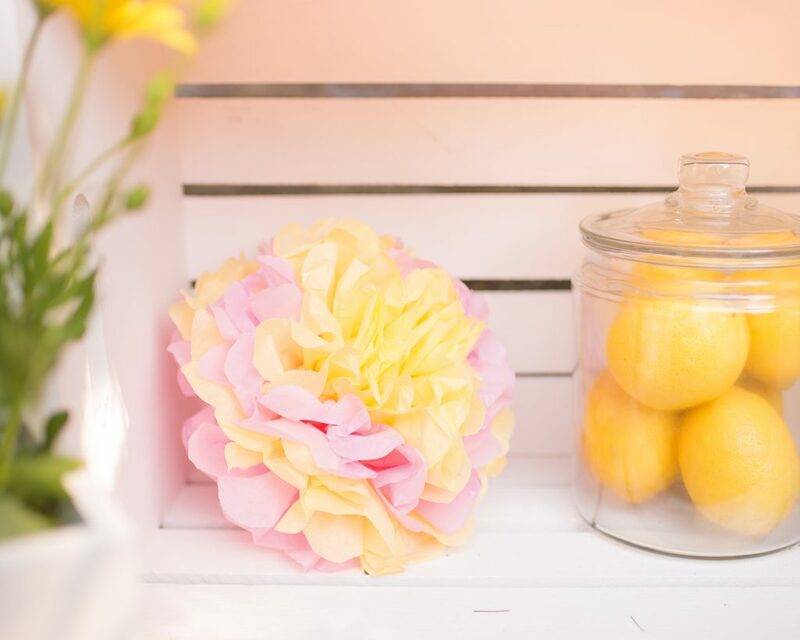 Pink and yellow layered tissue poms added a whimsical soft burst of color along side a jar of lemons. We created a tea party type atmosphere in my backyard. 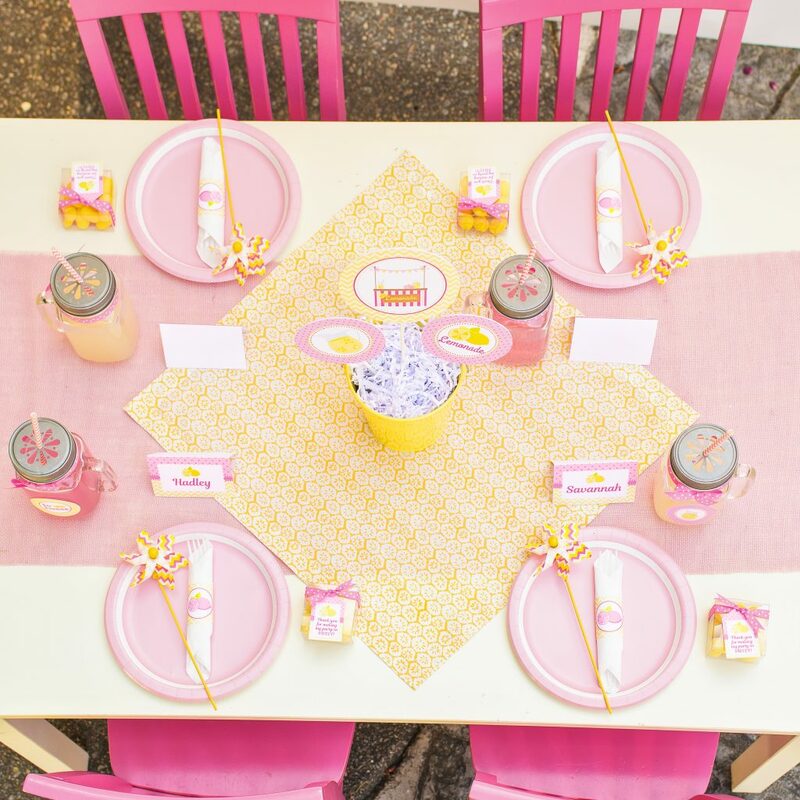 Dara’s cute Pottery Barn table and pink chairs could not have been more perfect. A baby pink burlap table runner was layered with a lemon slice cloth napkin to create a sweet tablescape. 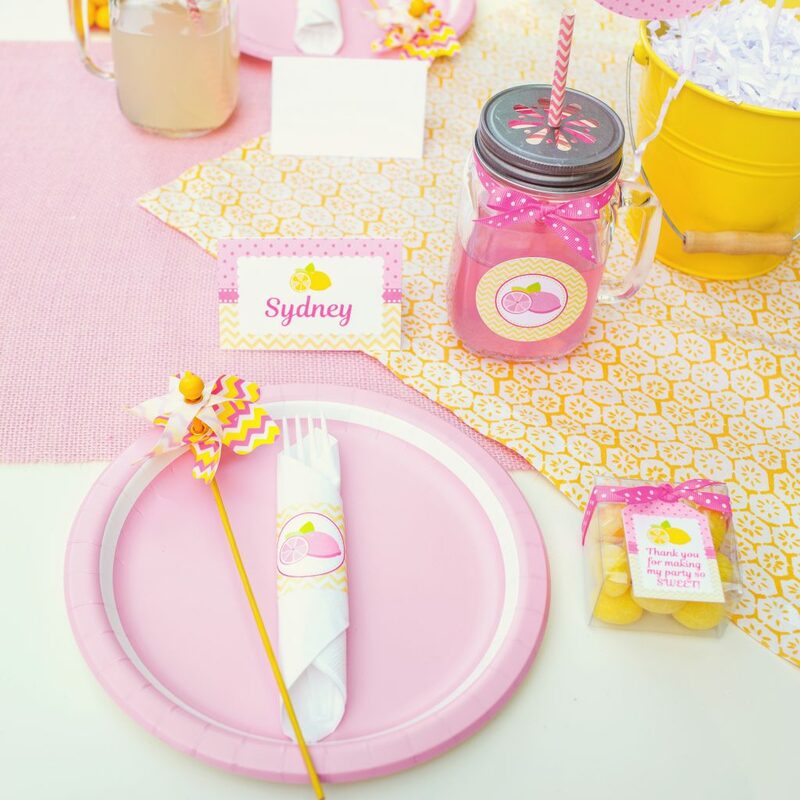 Each place setting had a placecard telling the girls where to sit, a fun pink and yellow pinwheel, silverware wrapped in my printable napkin wrap, a jar of sweet lemonade, and a favor box. 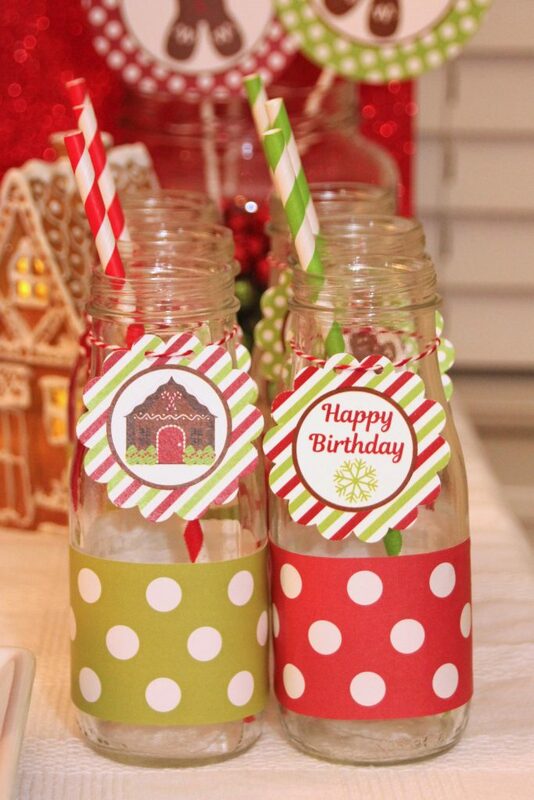 Dress up a mason jar with a ribbon, printable cupcake topper, and colored paper straw. I love how just a few little touches create such a custom fancy drink. 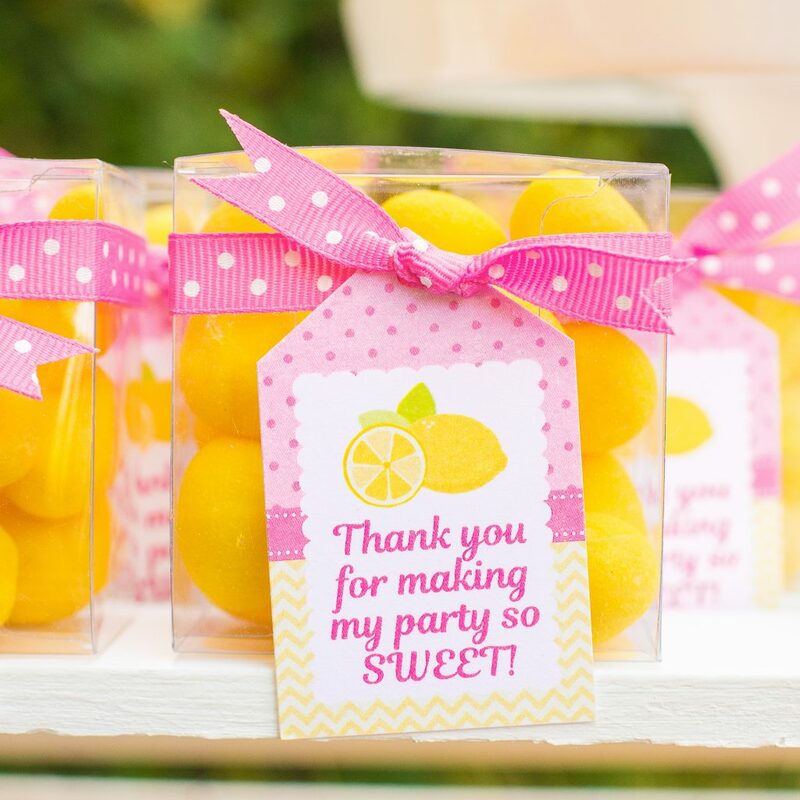 Lemon drops in clear boxes were the perfect sweet treat for the girls to take home. 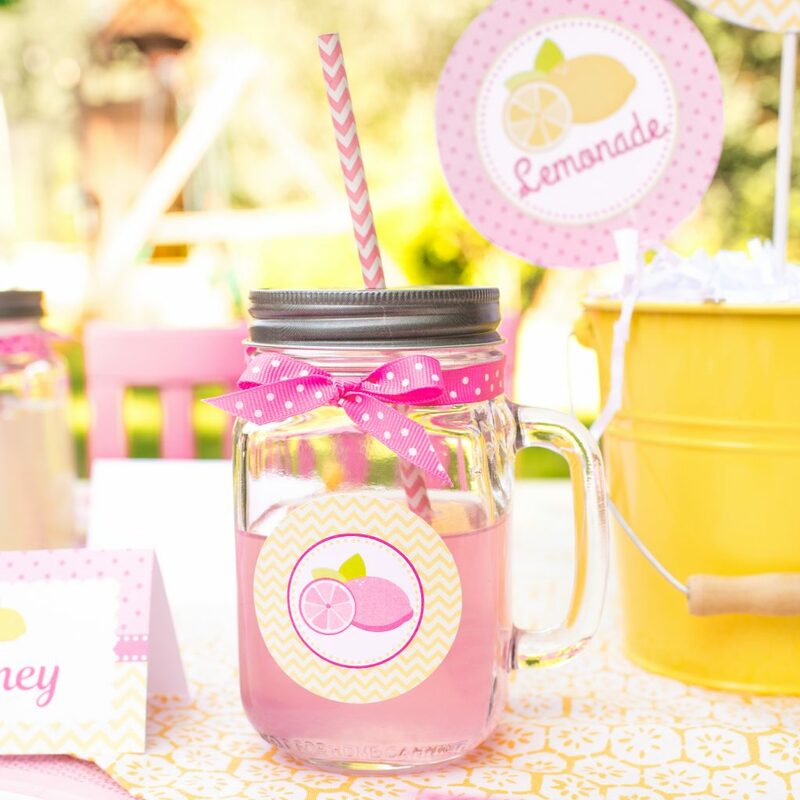 Just add a ribbon and printable lemonade favor tag. 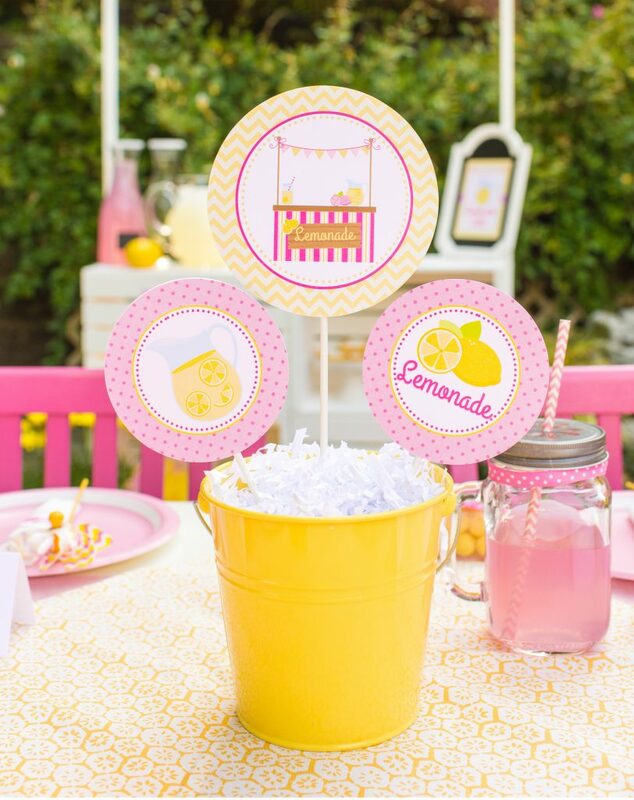 The center of the table featured my printable lemonade centerpiece set. A simple yellow metal bucket made it pop. 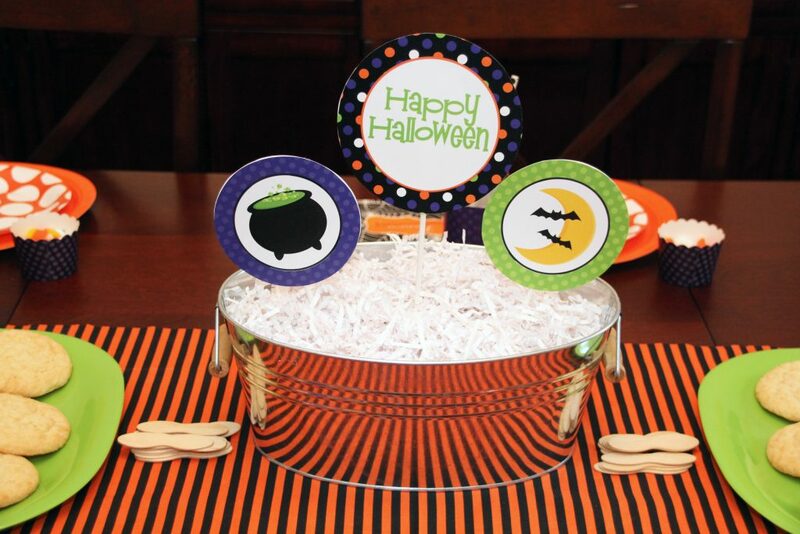 Make the circles double sided so guests can enjoy it from both sides of the table. 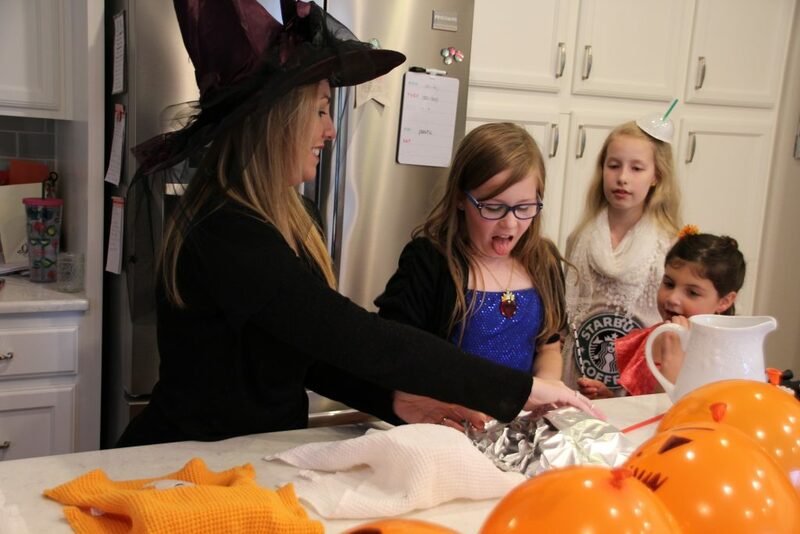 The girls were so excited to dig into these yummy treats. They had fun just being giggly girls. It was so fun watching them enjoy all the little details. We enjoyed lots of yummy sweet lemonade of course. And went back to pour even more. I think they would have spent all day playing at this lemonade stand if they could have. Their dolls even got in on the fun. 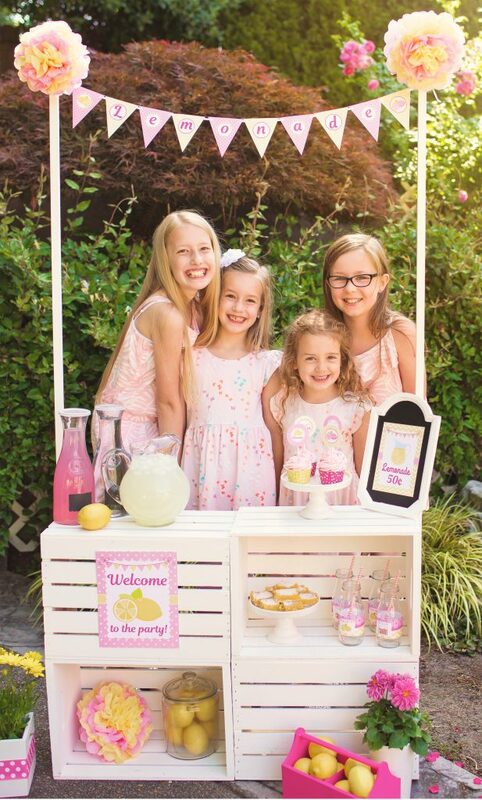 Our lemonade stand party was a big hit. 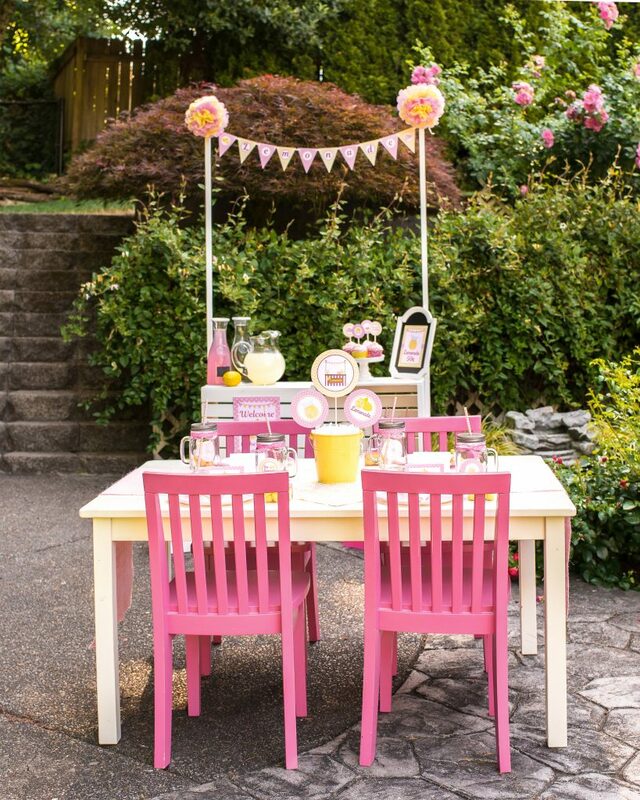 Perfect for a backyard treat with friends, birthday party, or even a lemonade stand in the front yard. 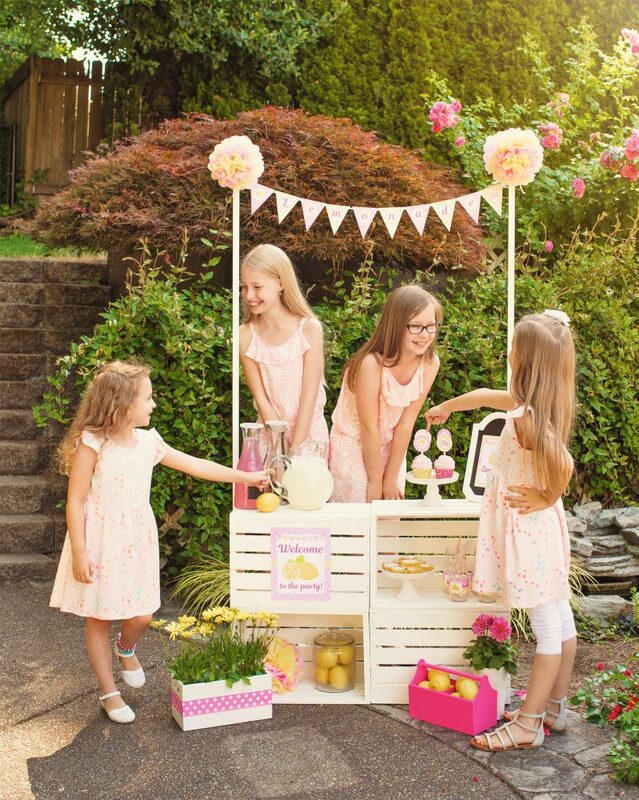 How could neighbors resist this cute lemonade stand? 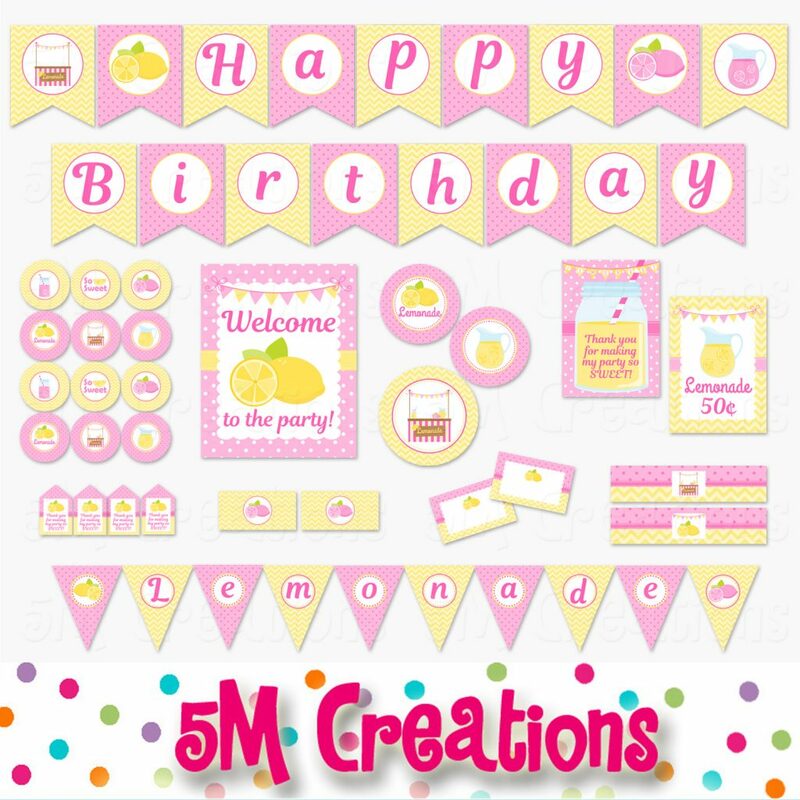 My printable lemonade party decor package is available now in my etsy shop. It comes with all the printable decor you saw above plus a Happy Birthday Banner. 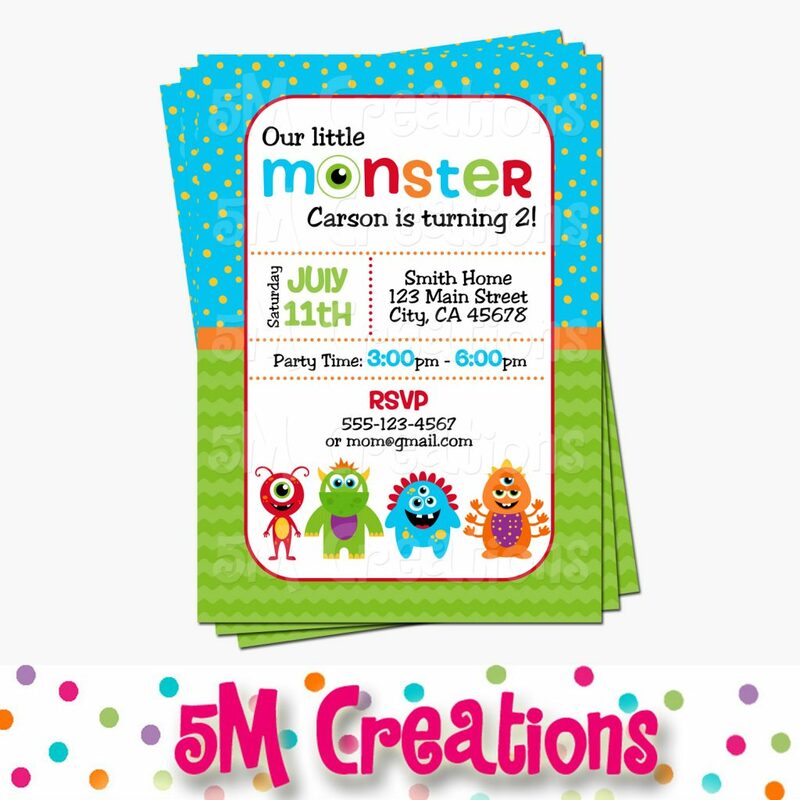 2 matching invitation styles are also available. This tribal baby shower has become a best seller in my shop. 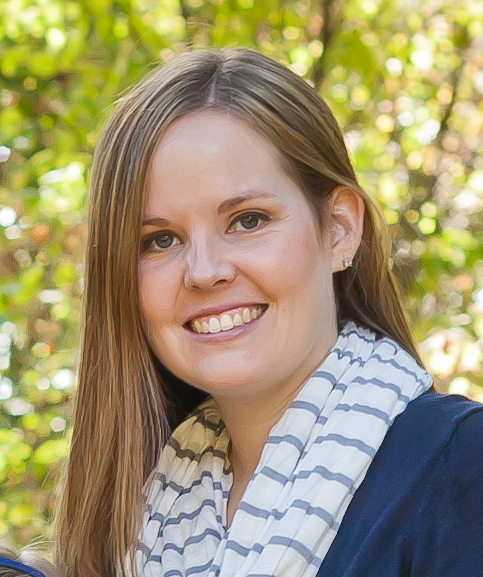 I thought it was about time to share with you all the party details. 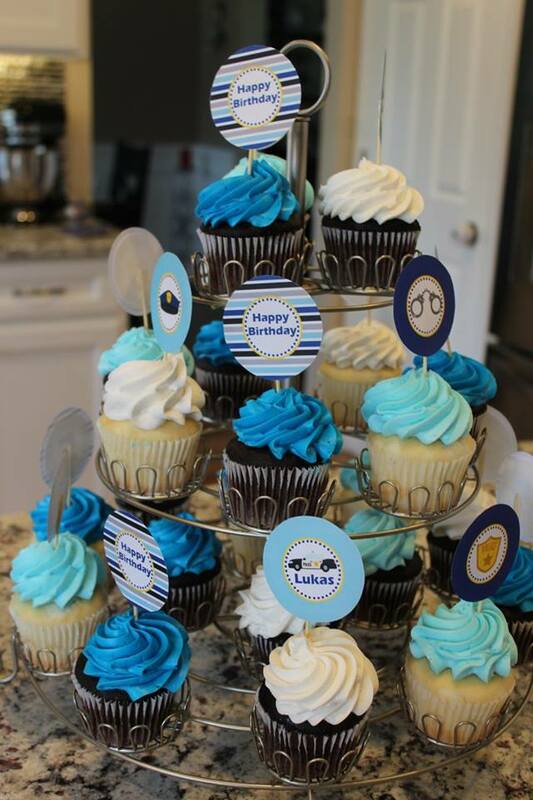 I was honored to co-host a baby shower for a dear friend’s 2nd baby boy. She had a squirrel as her only suggestion for a theme. 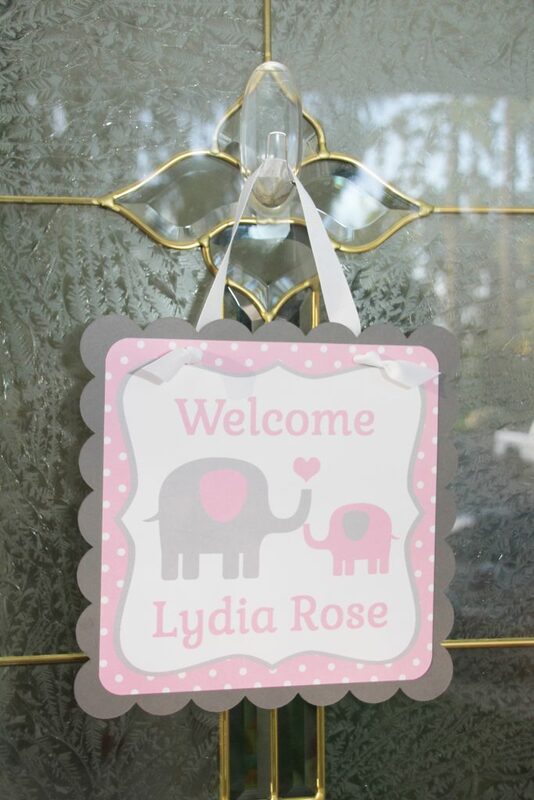 I love throwing showers that I can incorporate decor into a gift for their nursery. We had done a fox woodland theme (you can see it on the blog) for her last son so wanted to go a slightly different direction. We did more of a tribal feeling theme. We used teepees, arrows, feathers, and the cute little gray squirrel. It was such a fun theme that lent itself to so many cute details. These layered banners made such a big impact in the room. I love the use of twine to tie them continuing the earth tones. The row of arrows tie into the patterns on the It’s A Boy banner. The tiny teepees were clipped onto the twine with mini clothespins. 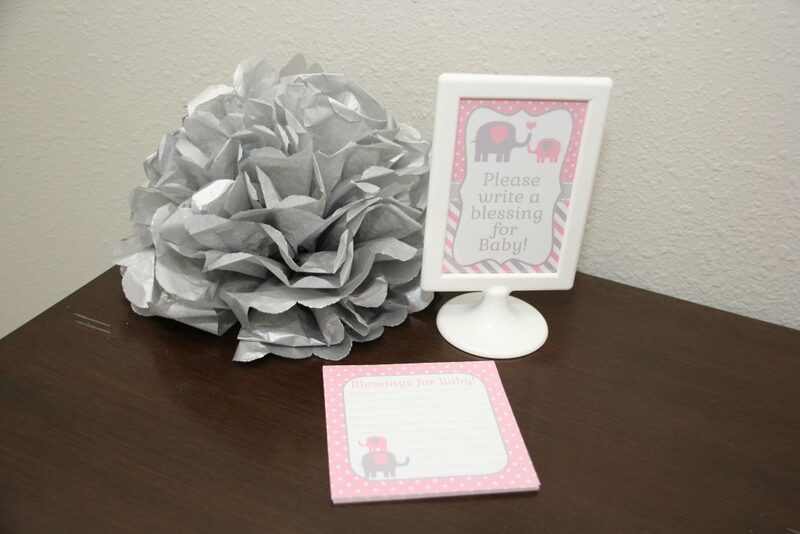 All of these items are included in the tribal baby shower printable party decor package. The package also includes images of teepees, arrows, and dream catchers if you are not using squirrels. These would all be adorable in the new baby’s nursery after the shower. This cake was custom made to coordinate with our invitation. You can see the inspiration at the bottom of this page. I love the look of the cake on the woven basket and tree slice. We tried to incorporate as many natural elements as we could. This branch frame was the perfect addition and a great find at a local craft store. The addition of the clothespins and baby photos made a great gift for the mom to be. We had a second table just for the all the yummy food. On the back wall you can see 3 custom pieces of art that will be used as a gift for mom for baby’s room. The center image has all of baby’s birth stats. This shower was thrown after his arrival. I am working on adding more sets like this to my shop soon. 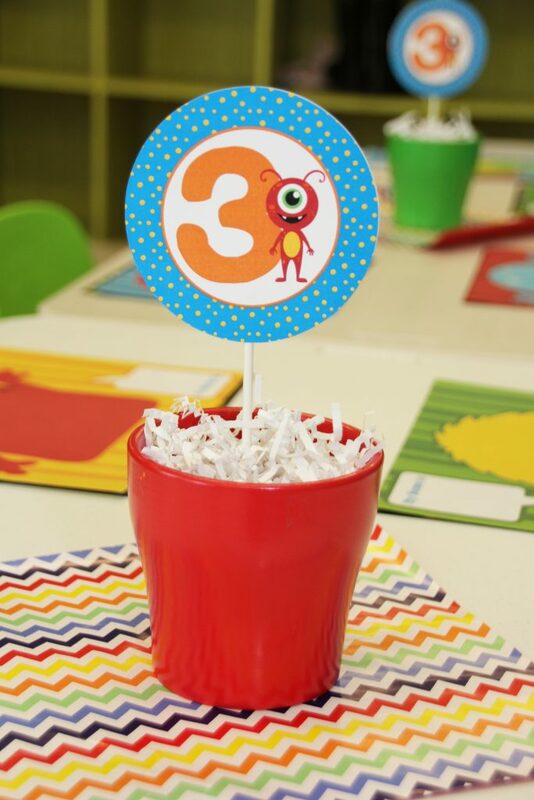 A sweet printable centerpiece incorporated baby’s name and the images used throughout the party. 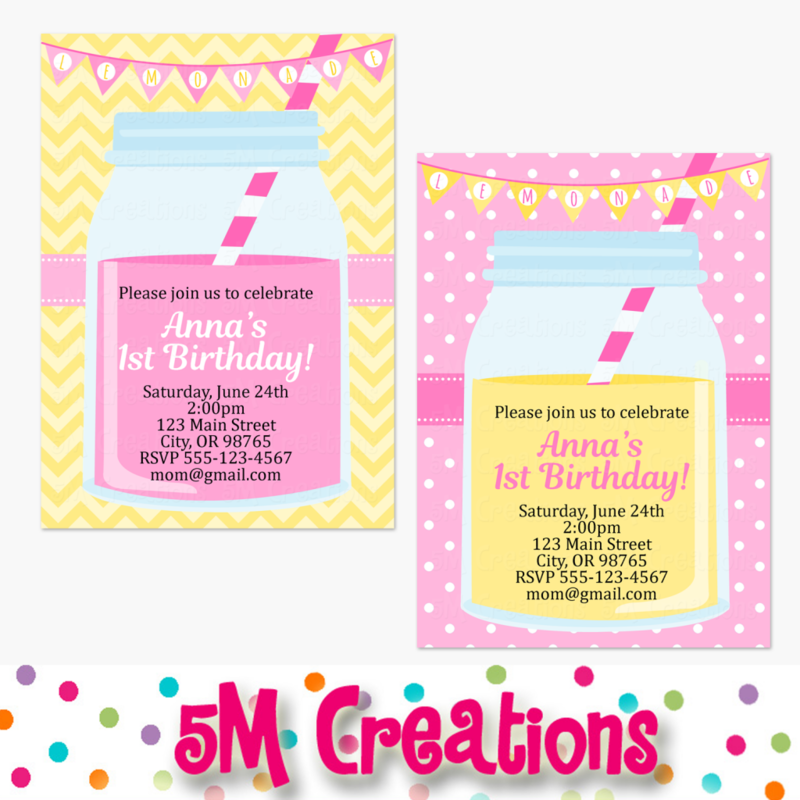 As I mentioned before several other images are available in the tribal baby shower printable party decor package. These little teepee hats were one of my favorite items we created. They were on both tables in the 2 coordinating papers. 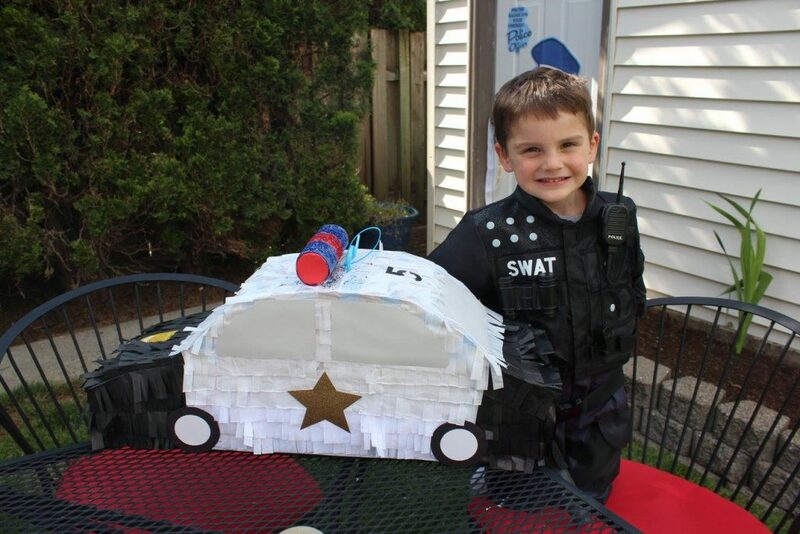 The paper feathers were the perfect touch. My favorite stacking tray was used once again in this shower. Tiny little acorn cookies filled the top tier, pinecones to add to the nature feel and yummy veggie cups. There were lots of yummy food items for guests to enjoy. Pinwheel sandwiches, cheese and crackers, apples and dip. These tiny chicken salad appetizers were an easy but savory item to include. 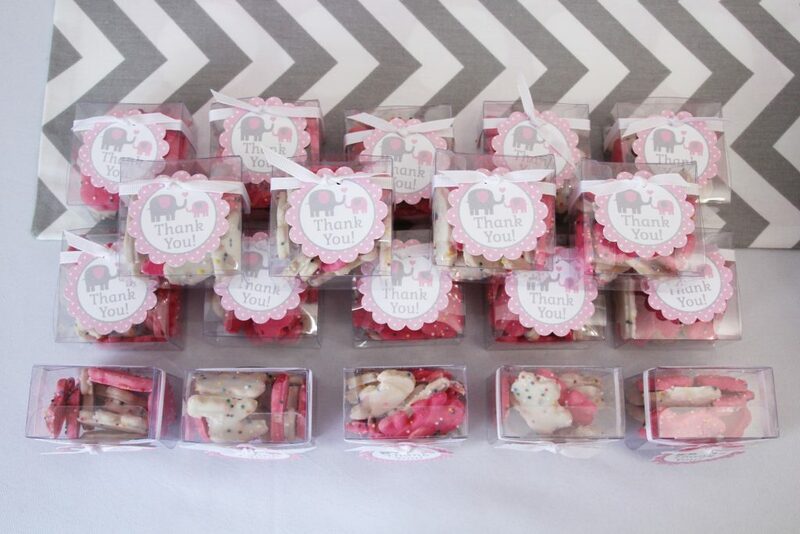 For baby showers I love doing an assortment of finger foods that feel fancy. The chocolate dipped pretzels mimicked our trees on the decor perfectly. Once again here is my love for napkin wraps. 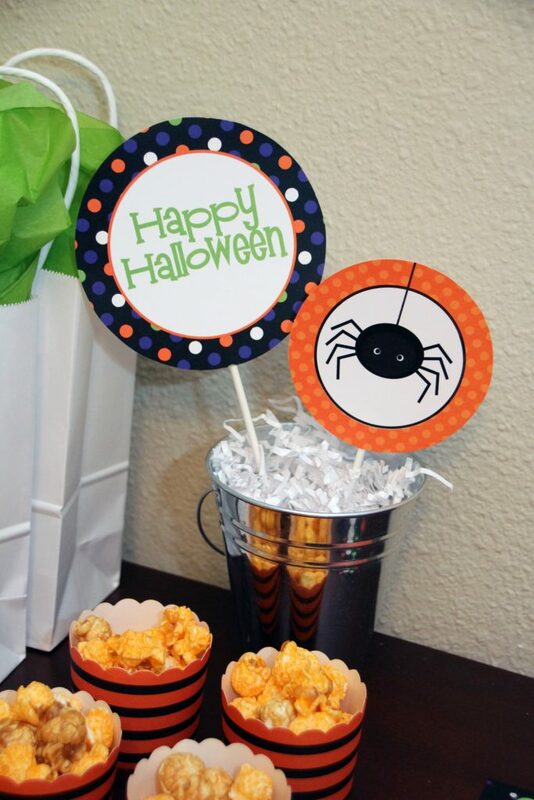 These were made from the matching patterned paper and placed in a cute mini wheel barrow. 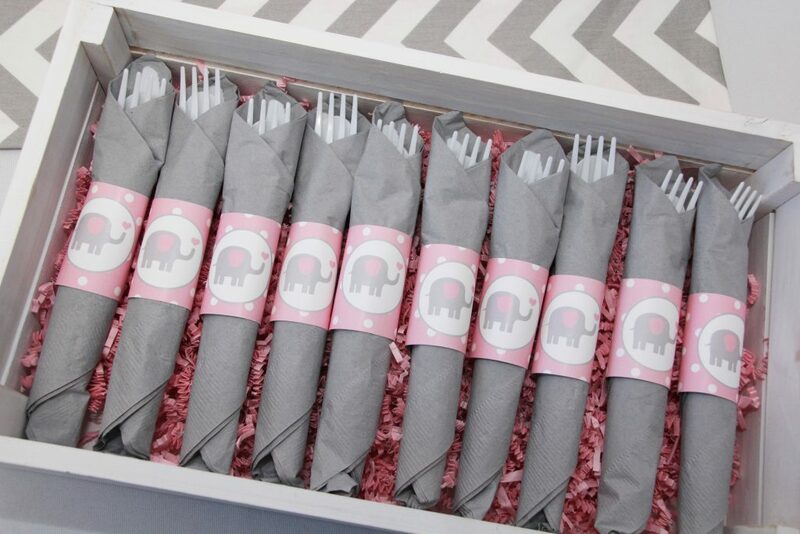 The wooden silverware follows our natural elements throughout the baby shower. 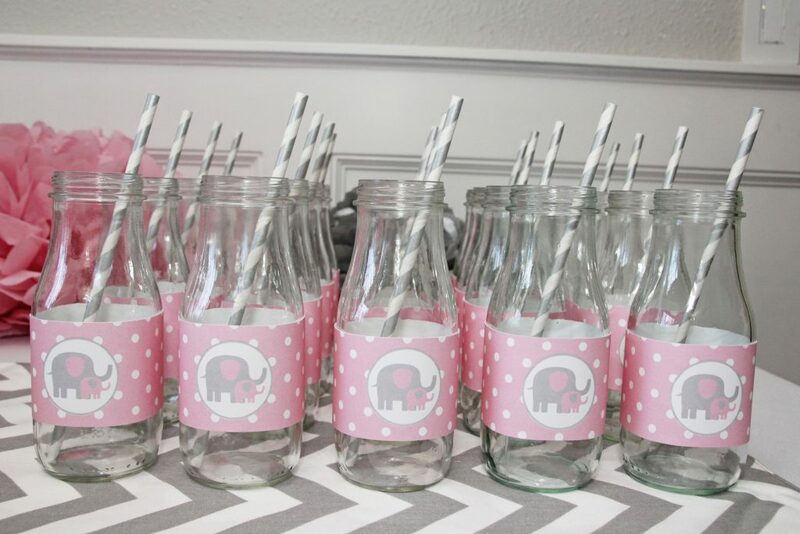 Since we did not have cupcakes I used the toppers on glass milk bottles for the guests to enjoy beverage in. A touch of twine and a paper straw dressed up an ordinary container. The beverages were in the kitchen, but there was no reason this space should be ignored. A branch with pinecones and a simple vase of flowers pulled together an otherwise boring area. 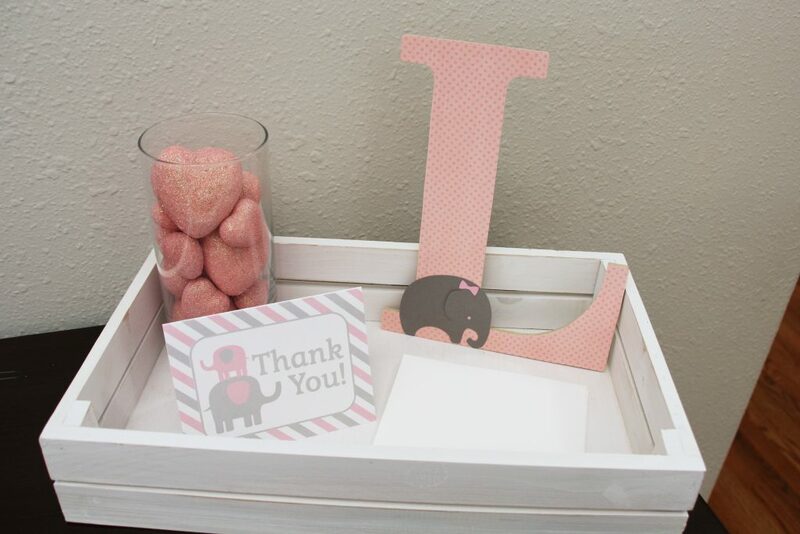 My co-host found these sweet items for the baby’s nursery so we used them on our gift table. Isn’t that wooden teepee art amazing? We played 2 games. The Price is Right and Scattergories. 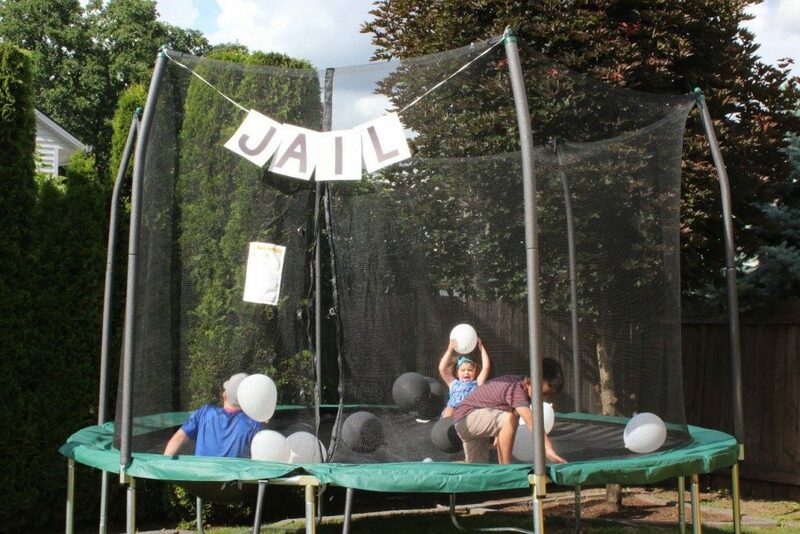 I don’t know about you but I am not a huge fan of typical baby shower games. These were fun and brought out the creativity and competitiveness of the group. They will be available in my shop shortly along with a bingo card. As guests entered and left the party this was in the entry. I created another large sign that could be used in baby’s nursery but also welcomed guests to the space. Don’t be afraid to use frames already in your home by adding custom art. Each guest signed this squirrel book with a message for baby as he grows. What a special keepsake from a fun day. The blue jars you see were the prizes for the games. Mason jars make such cute vessels for so many things. We had them filled with flowers in several places as well as the acorns above. The favor bags each had a printable favor tag and paper feather clipped with the mini clothespin. Inside were yummy truffles and salted caramel chocolates. I love sending guests home with something to remind them of the party. The Tribal Baby Shower Printable Decor Package is available in my etsy shop. It is also available in girl colors. If you love this set but are throwing a shower for someone who doesn’t know the gender just message me. 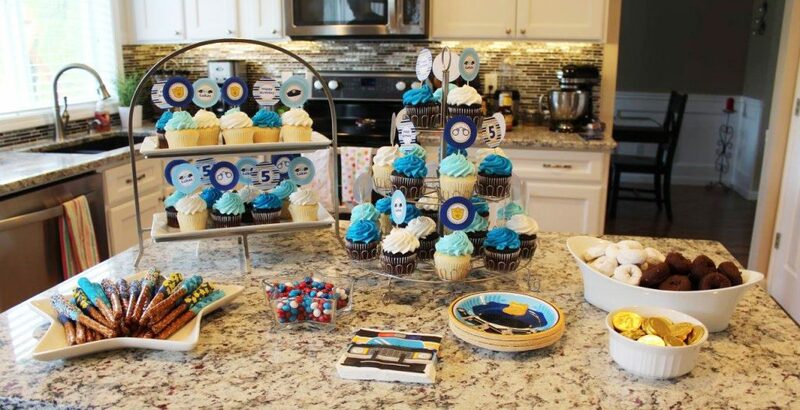 I would be happy to do it with Baby Shower wording vs It’s a Boy/Girl! This is the original invitation created for the shower. I love the tall trees on either side. 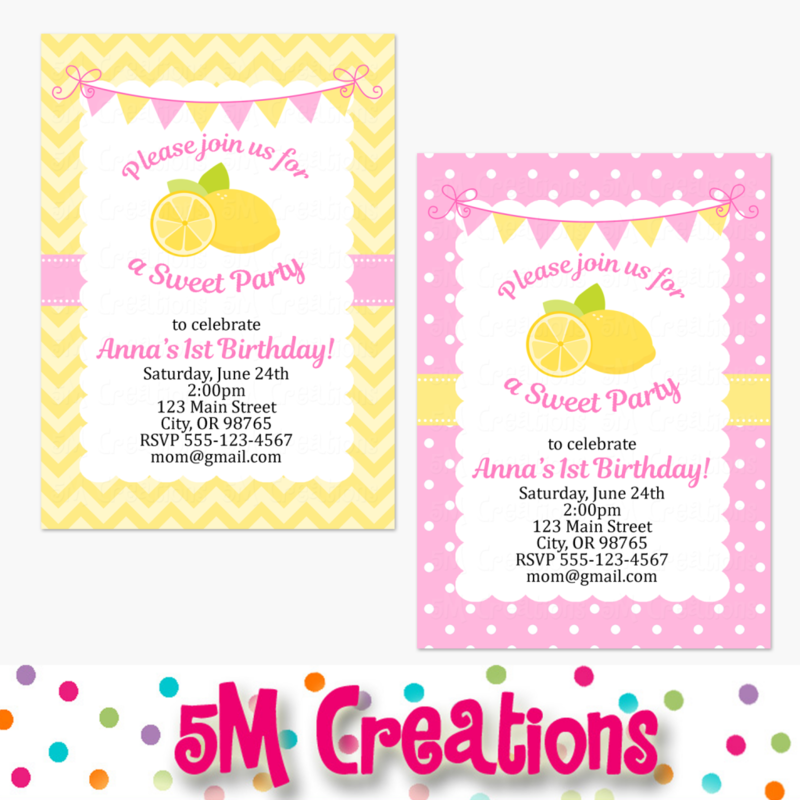 I also created this version in both a baby shower and birthday party layout. 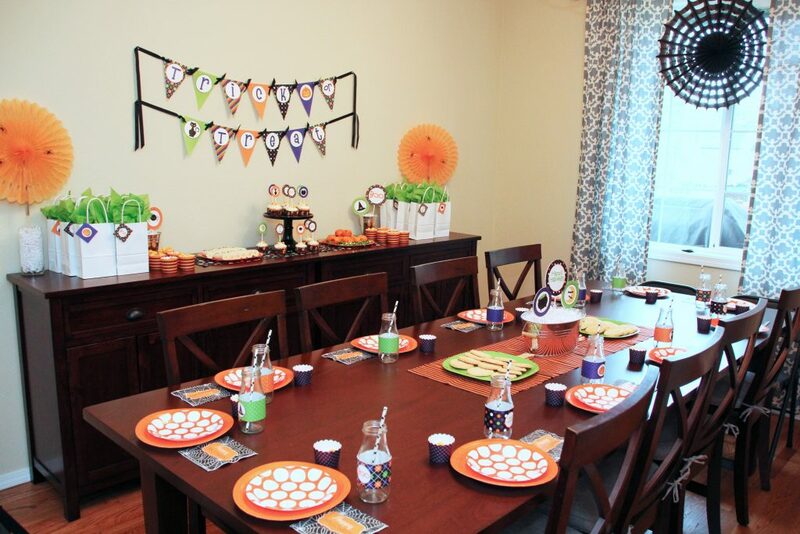 Wouldn’t a Tribal Birthday Party or a Wild One Birthday Party theme be so fun? It is also available in girl colors. If you throw a party using either of these packages I would love to see photos of your event. You can email them to fivemcreations@gmail.com. 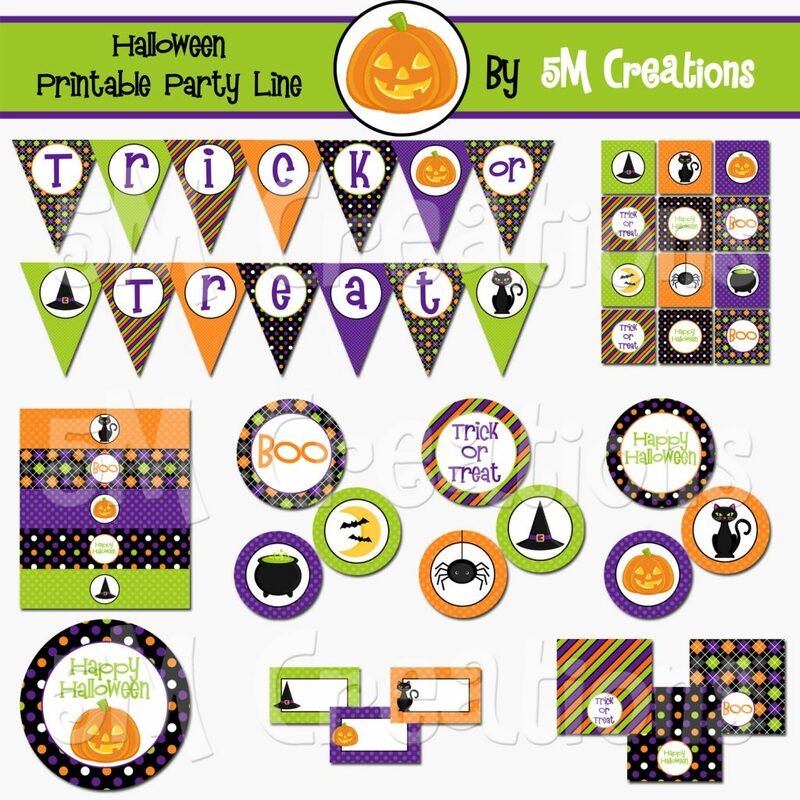 I am always looking for parties to feature here or in my shop. Welcome to our Donut Shop! 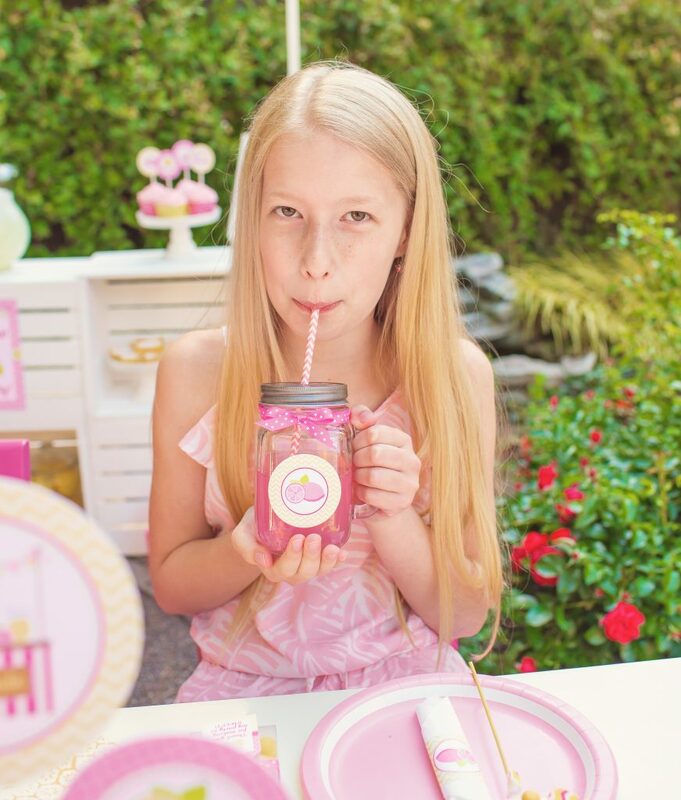 In today’s post I am sharing ideas for throwing a donut themed birthday party. Set the stage for your guests with a great invite telling them about your theme before they ever step foot into the party. We used this printable donuts and pajamas party invitation. It features bright colored donuts, sprinkles, and fun coffee(hot chocolate) cups. 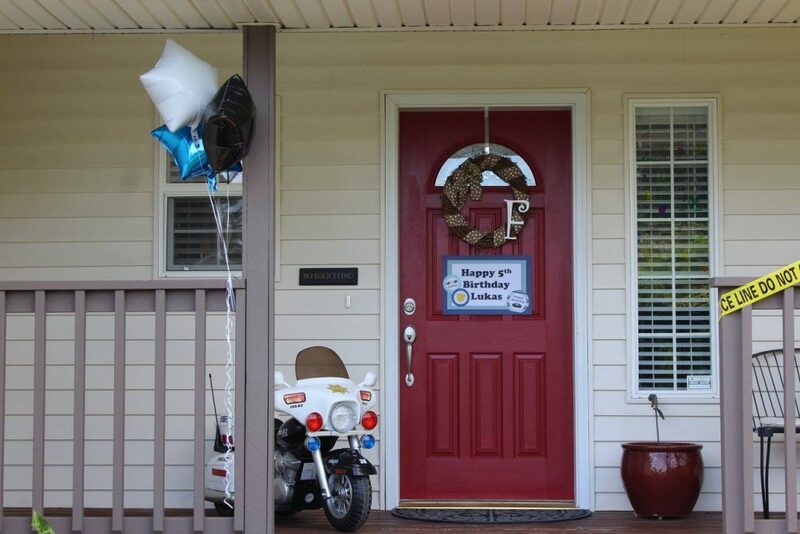 We welcomed the guests with this printable donut sign on the front door. My daughter wanted lots of and lots of bright colored donuts on display for this party. Donuts were everywhere! 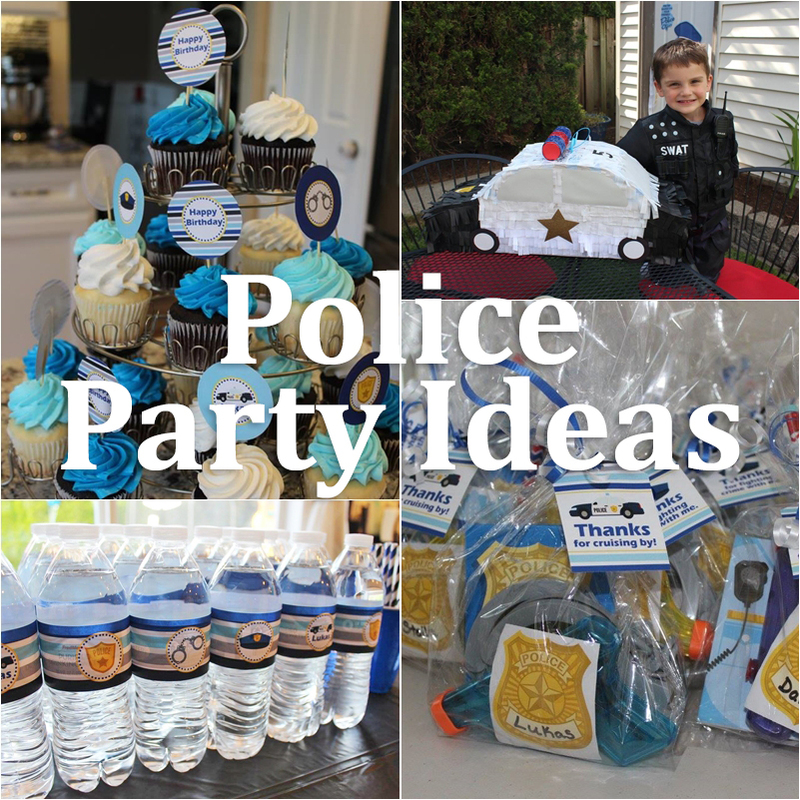 From real donuts, to balloons, plates, centerpieces, and banners. We created a colorful party table with different heights of cake stands piled high with donuts in lots of colors and shapes. 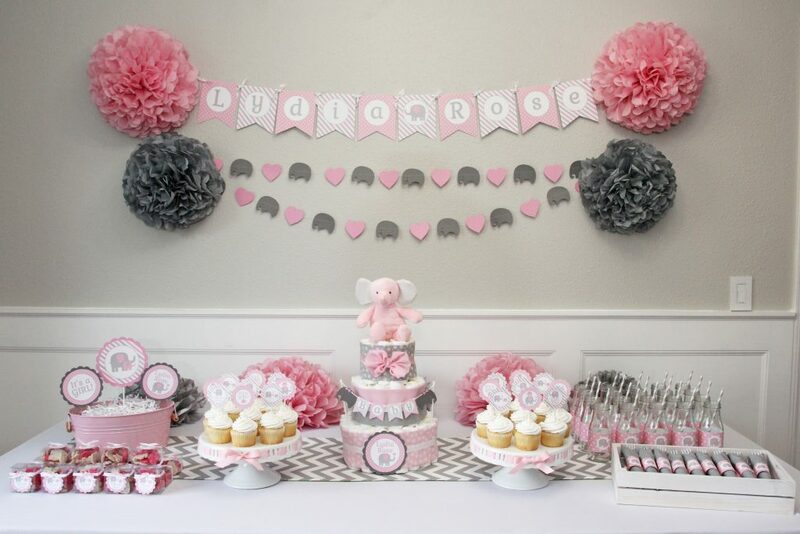 The tassel garland and printable donut happy birthday banner just carried the colors throughout the room. I love the mini donut and coffee cup garland as well. It dressed up a plain tablecloth. You can never have to many donuts. Even though we had donuts for dessert, the birthday girl wanted a cake. Of course a giant donut cake was the only answer. I love the classic light pink frosting with sprinkles. Donuts everywhere! 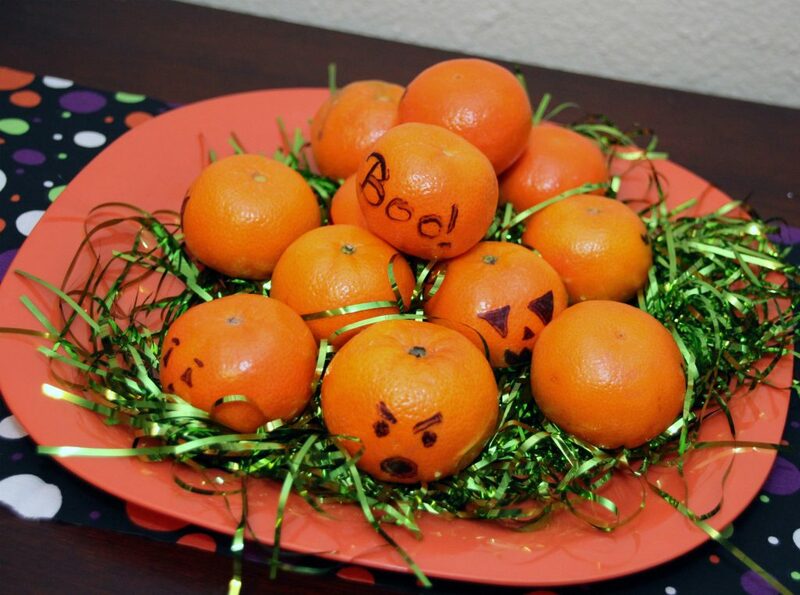 They were the easiest decoration ever! All you have to do is stack them up on cute trays and they make such a big impact. My dining room was the perfect space to create our donut shop. We even swapped out our normal curtains for pink to make the space as girly as possible. Don’t be afraid to use what you already have in your space. Just customize it for your theme. Add photos to existing frames, cover throw pillows on couches with cute pillow covers to transform your space. 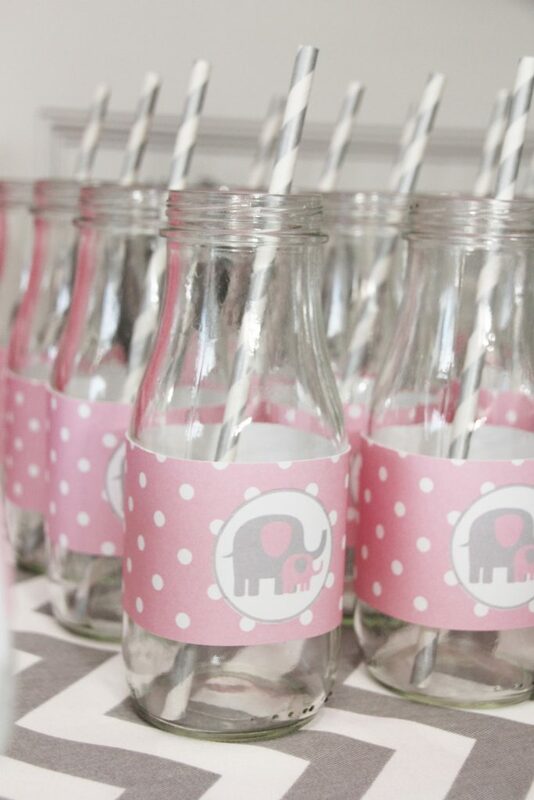 Printable water bottle labels around glass milk bottles made adorable glasses for the girl’s beverages. I purchased the starbucks iced coffee drinks from our local Target and removed the labels. These donut shaped balloons were found at a local party store. 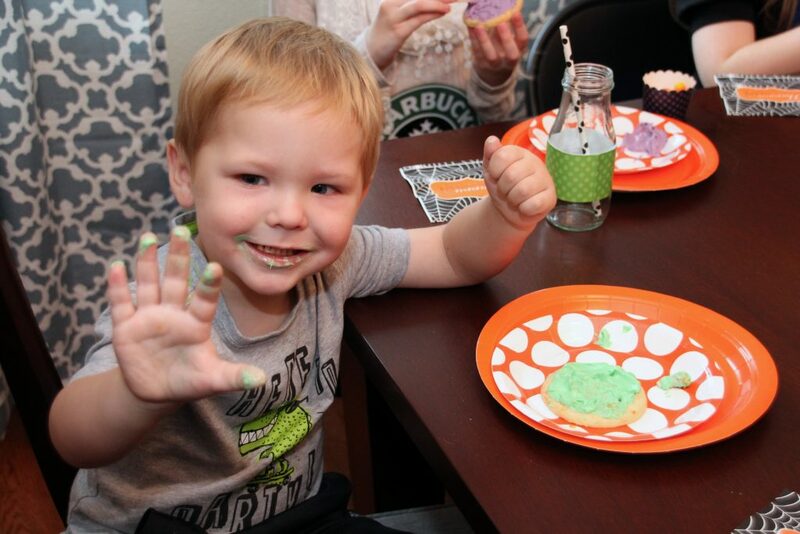 I used acrylic craft paint to create frosting and sprinkles in our party colors. The Donut Shop sign above was a fun find at Home Goods. The Canvas below was colored by my daughter. We found it at Hobby Lobby. My daughter now has them in her bedroom. Think outside the box when it comes to decor. Use things that you can reuse in your home later. 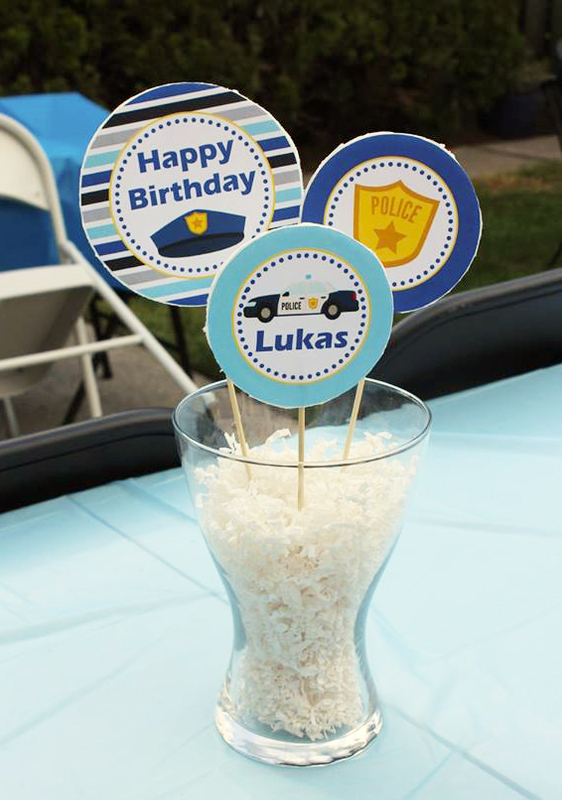 Mini number balloons and our printable donut party centerpiece circles created the main centerpiece on the party table. The chevron table runner added a splash of color to a bland white table cloth. Sprinkle confetti was created by punching circles out of tissue paper. 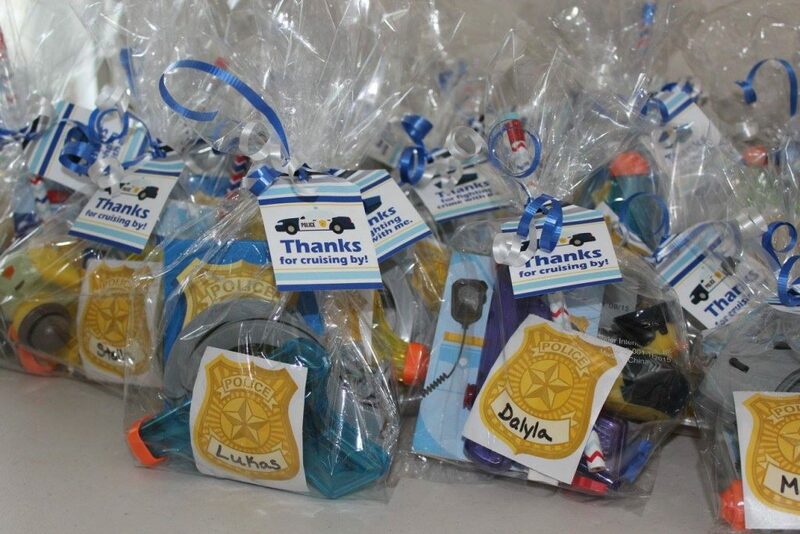 2 smaller centerpieces were created using the garland images and printable donut party centerpiece circles. 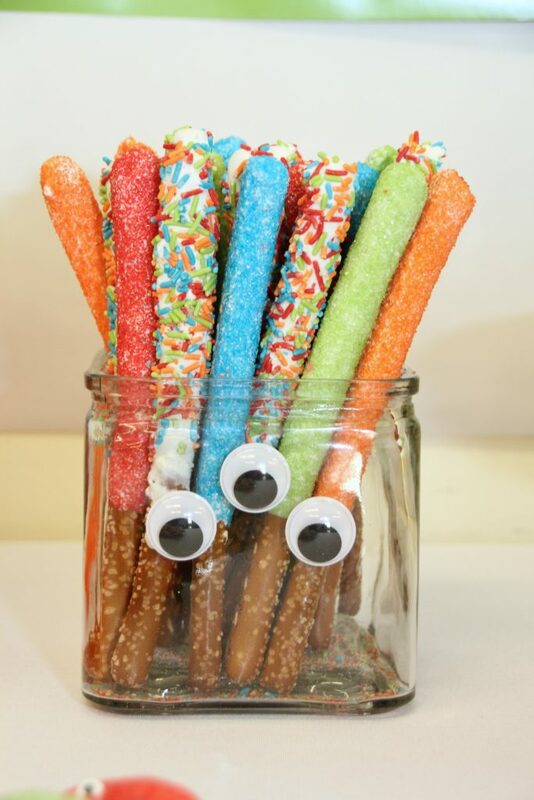 Just add them to white lollipop sticks and insert into cute containers. I find all different sizes and colors on a regular basis in the Target Dollar Spot or our local craft stores. I typically only pay $1-3. I have collected them throughout the years in many sizes and colors. My daughter wanted to set up a mini donut party for her American Girl doll to enjoy as well. We made a mini donut balloon by not inflating one of the balloons fully. 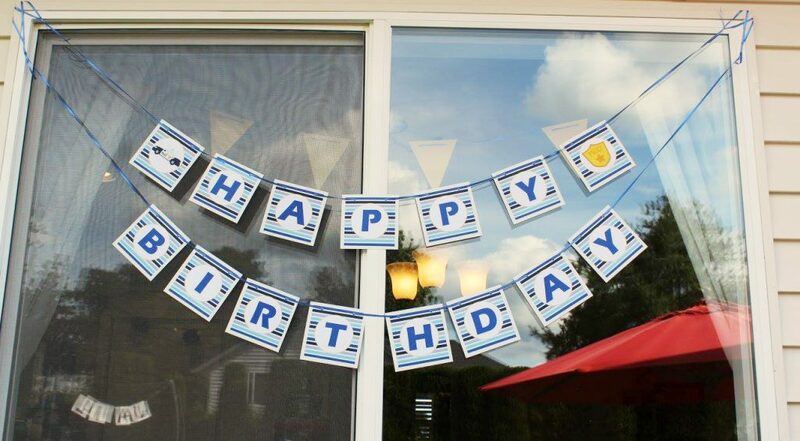 She also made a cute pennant banner using the matching printable paper from the party package. Spinkle donut plates, hot pink coffee cups for hot chocolate, printable donut bingo cards, and tent cards created a place setting for each girl. 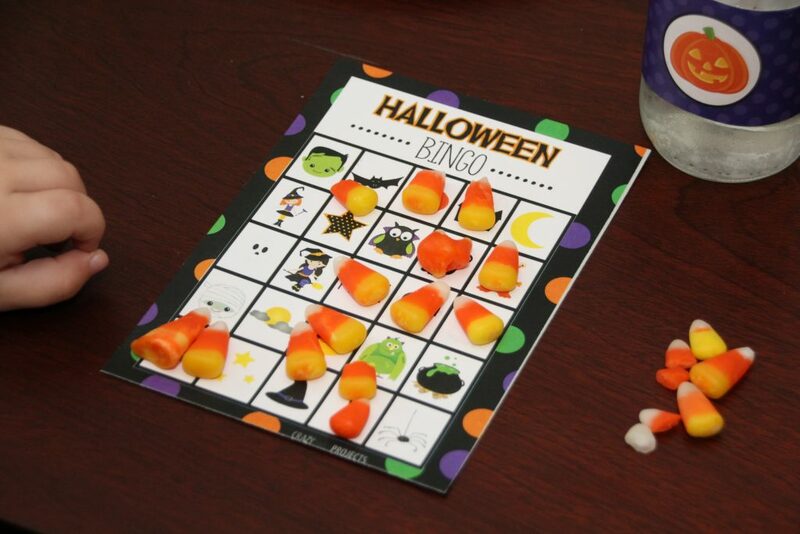 The first event of the evening was playing bingo. I created printable donut bingo cards to match the decor. I purchased a cute mini bingo cage from Amazon and used donut cereal as the markers. They girls had such a blast playing bingo. We did several rounds. I had donut notepads as prizes. Once the girls had eaten their fill of donuts we played a few other games. The birthday girl wanted to have donuts and hot chocolate as her theme. We played off the hot cocoa by using marshmallows to do a few relays. They formed 2 teams and carried marshmallows on spoons across the room and back. They then had to pass the marshmallow to a teammate using no hands. It was so fun to watch. The blurry photo is because they were practically running. haha! They took it very seriously. The second game we played was a mini marshmallow toss. Each girl had a cup of mini marshmallows and had to toss them into a hot cocoa cup. Whoever got the most in the cup won. We broke them up in to 2 groups. As soon can see by my floor it was harder than it looked. Everyone came in their pjs of course. 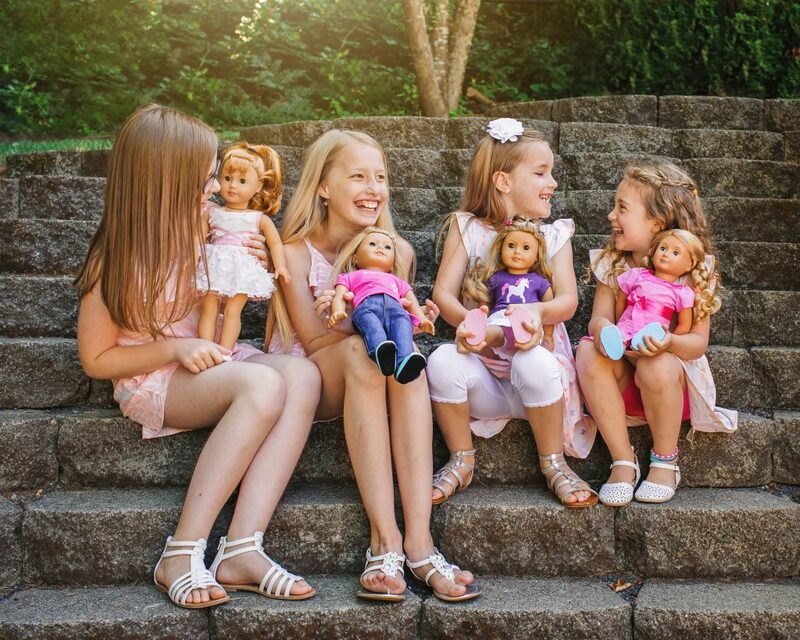 These crazy girls can have fun doing just about anything. Silly faces!!! I am pretty sure the girls were stuffed from all the donuts but we still had cake!!! Happy Birthday sweet girl! The next morning I created a donut inspired breakfast with not as many donuts. The girls were all glad for this. They got their fill the night before. Donut sprinkle cereal was a perfect option to carrying on the theme. This is the same cereal we used for Bingo earlier. The only actual donut for breakfast were these donut hole strawberry skewers. The I Love Donut milk bottles were used for our breakfast beverages. After all the party fun I loaded up extra donuts into gable boxes for the girls to take home. They also took home a coffee cup that had hot cocoa packets, sprinkles(sixlets), sprinkle nail polish, and a donut charm necklace. The birthday girl wore here necklace for the party. I hope you enjoyed all the donut party photos. 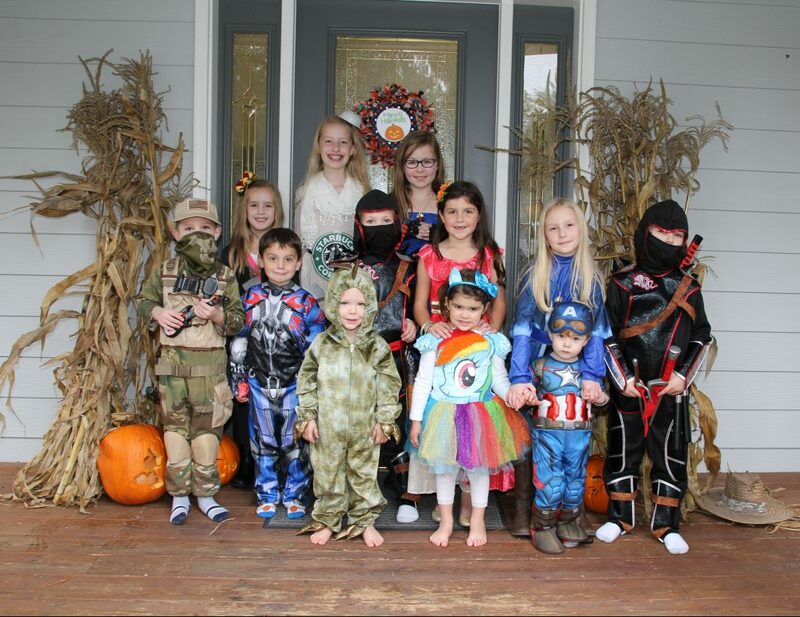 This was one of my favorite parties as it included donuts in so many ways. 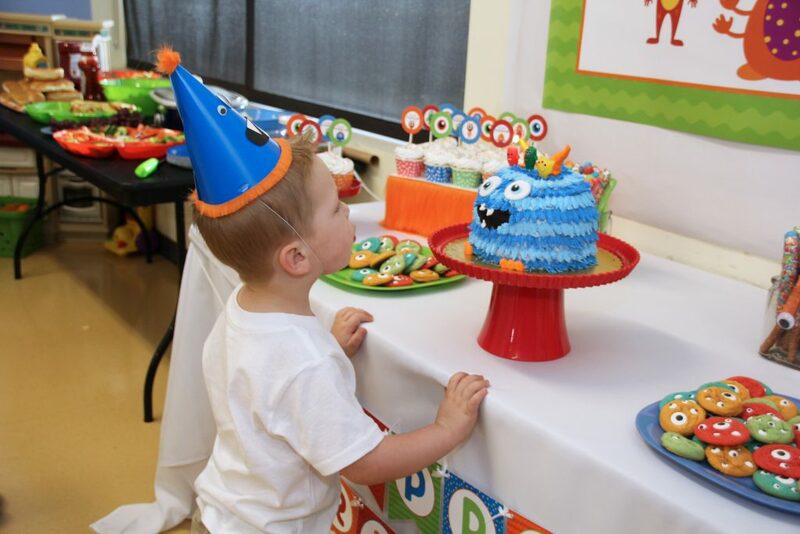 Creating all the little touches is what makes a party so fun! The Donut Printable Party Decoration Package is available in my etsy shop as an instant download. This matching Donut Bingo Card set includes 12 different cards. You can find the mini bingo cage here. 2 different styles of printable donut invitations are available in my etsy shop. If this doughnut party decor was not quite what you were looking for I have another doughnut package in my shop. 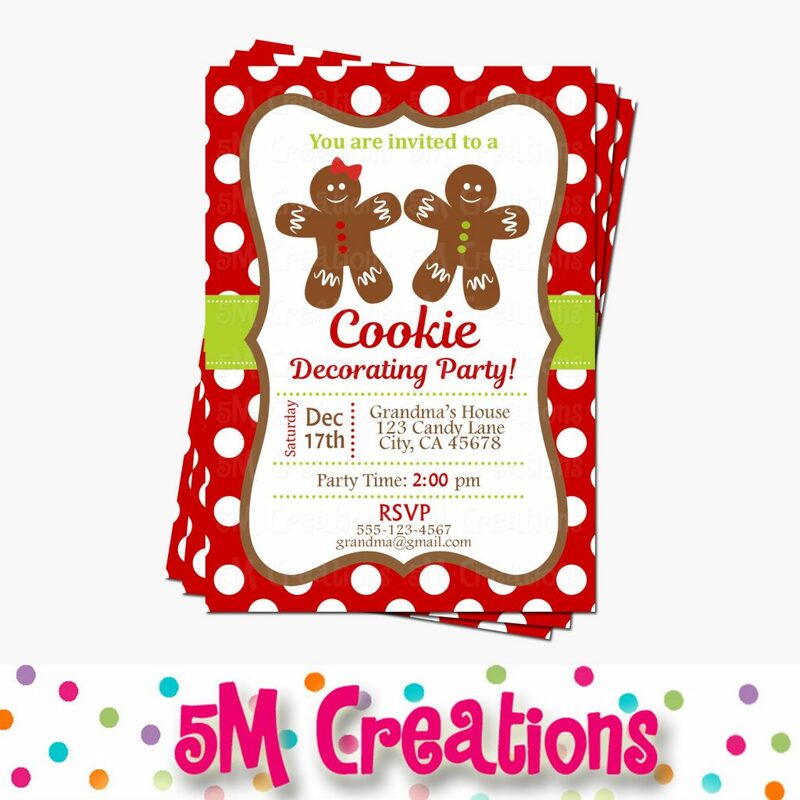 Take a look at the matching invites as well. 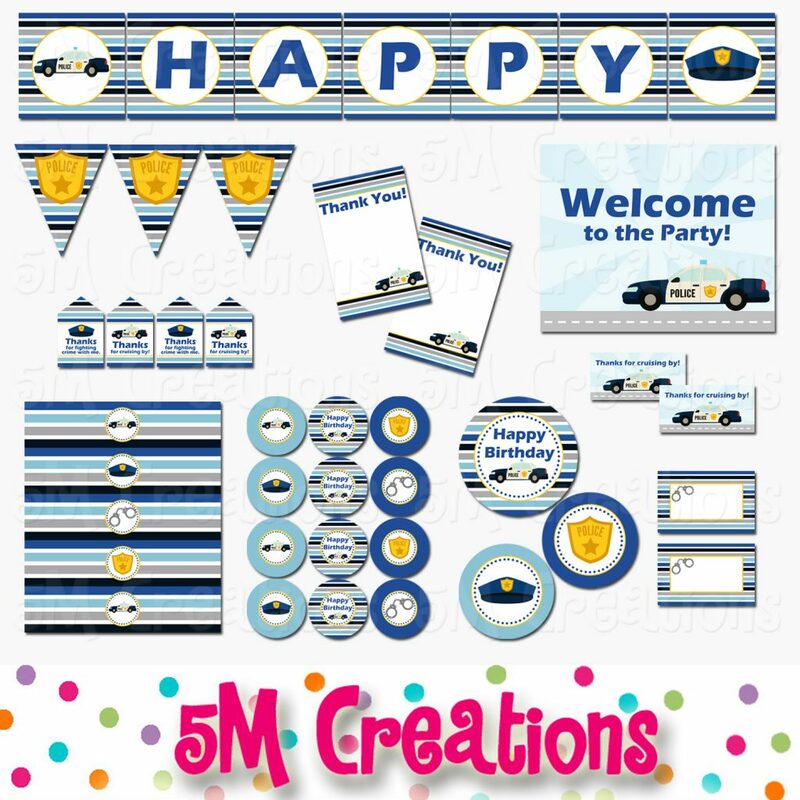 If you have used these printable products to create your own Donut Shop Party please send me photos to fivemcreations@gmail.com. I would love to see them and possibly feature them on the blog, instagram, or possibly my website. Thanks for stopping by!